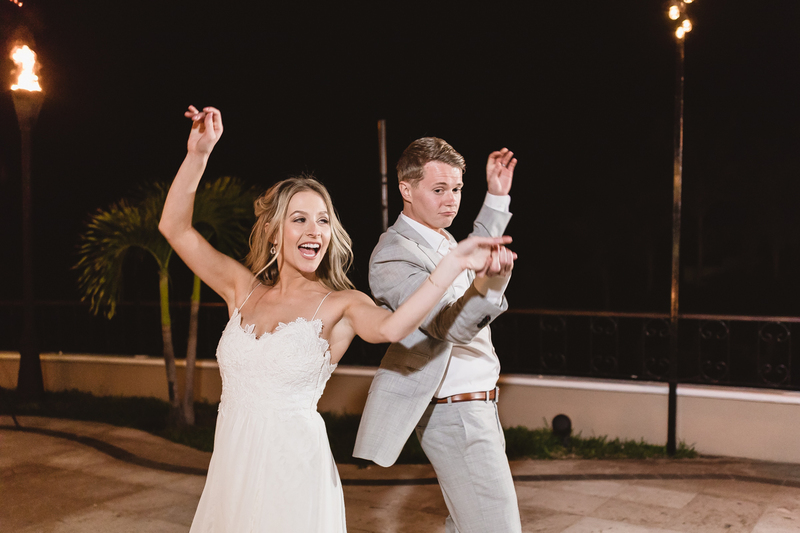 Maggie and Charles are young, fun and full of contagious energy. 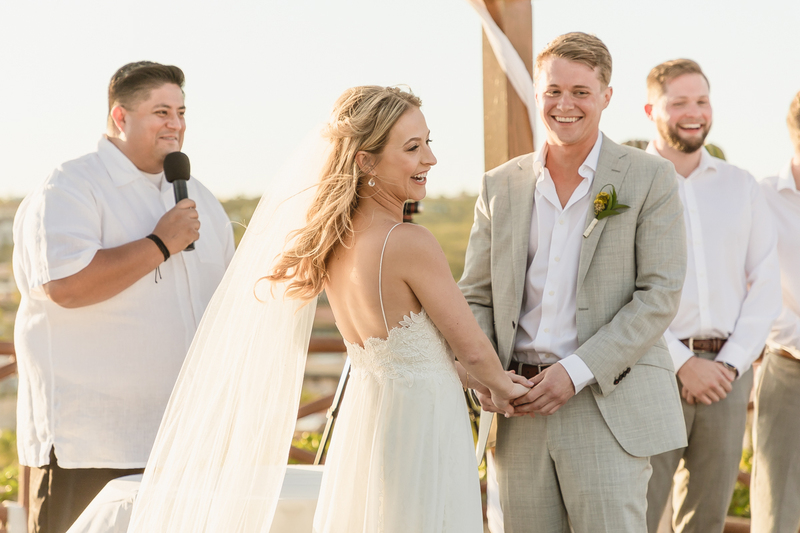 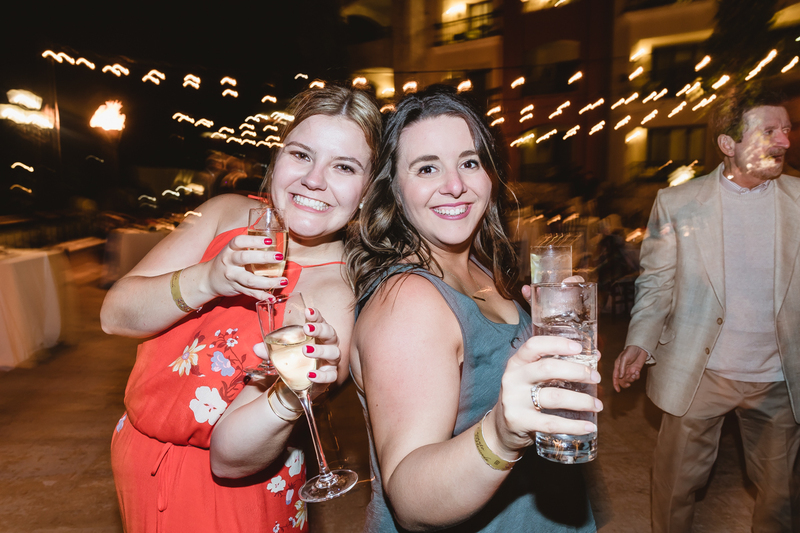 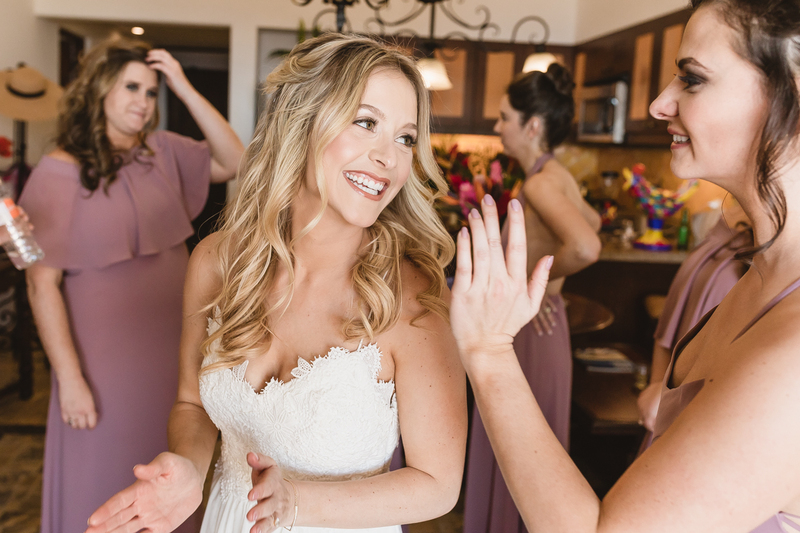 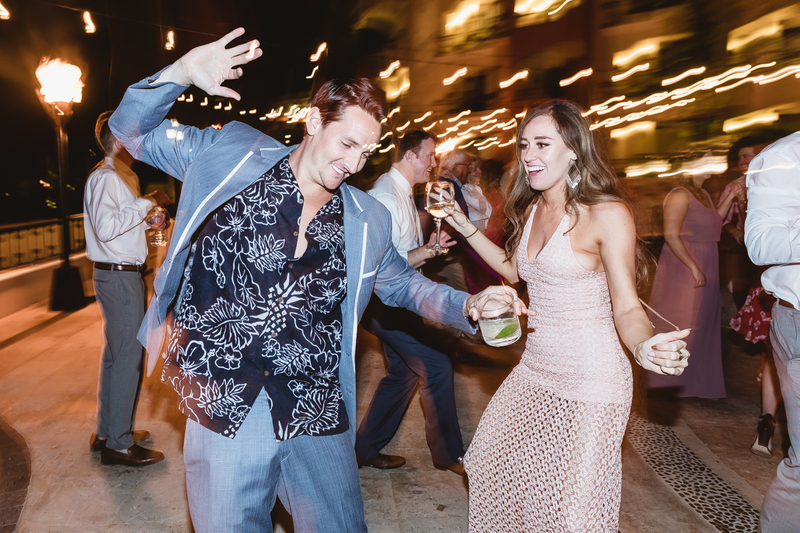 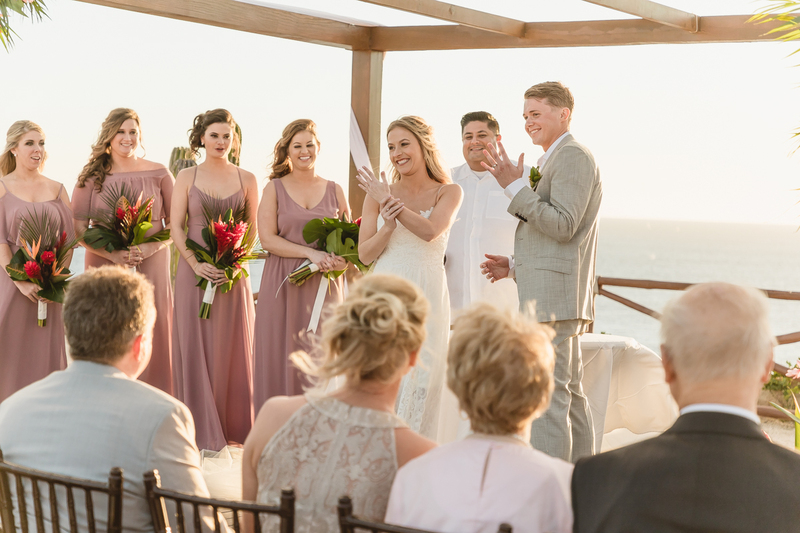 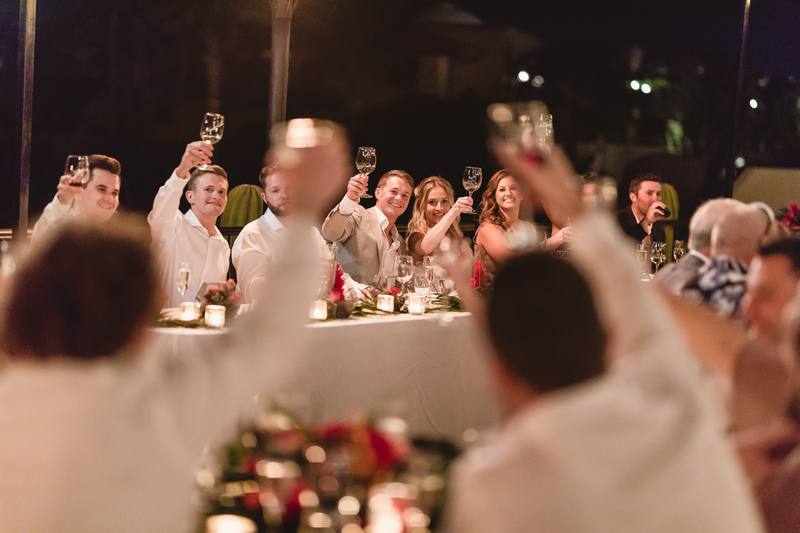 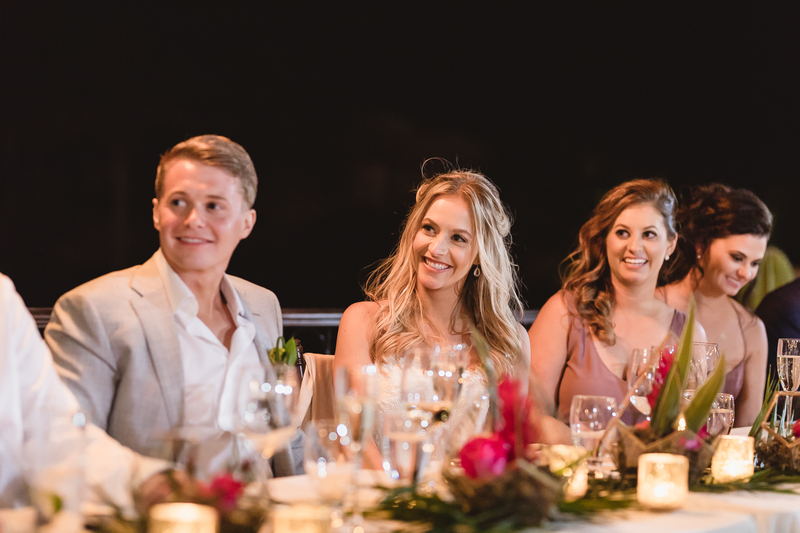 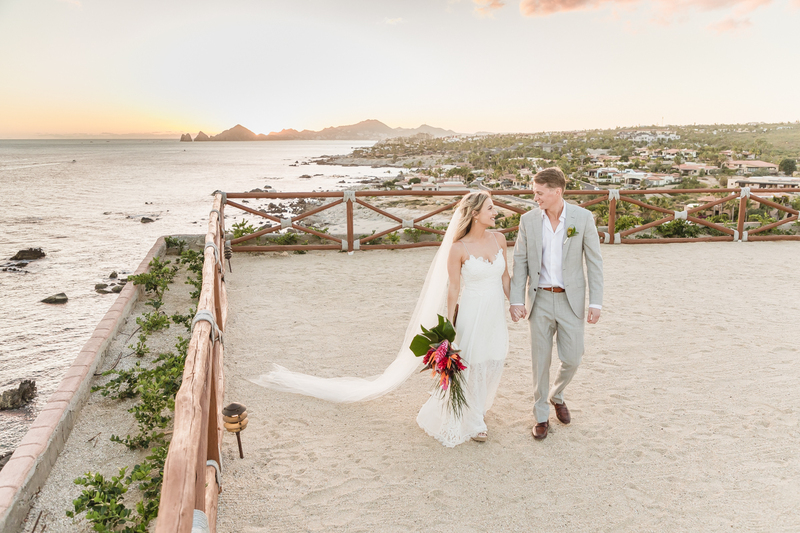 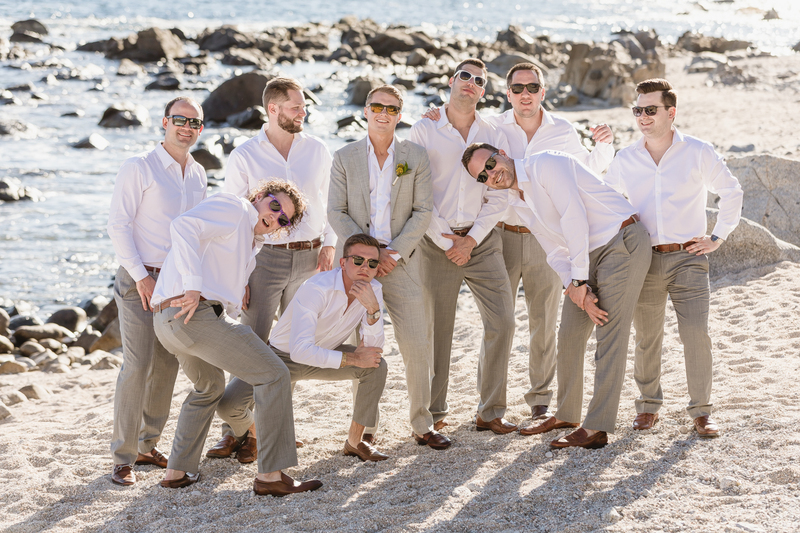 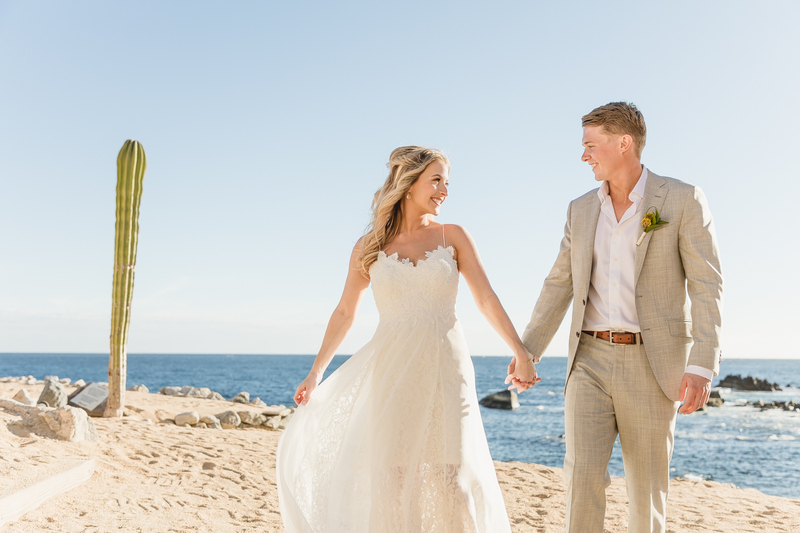 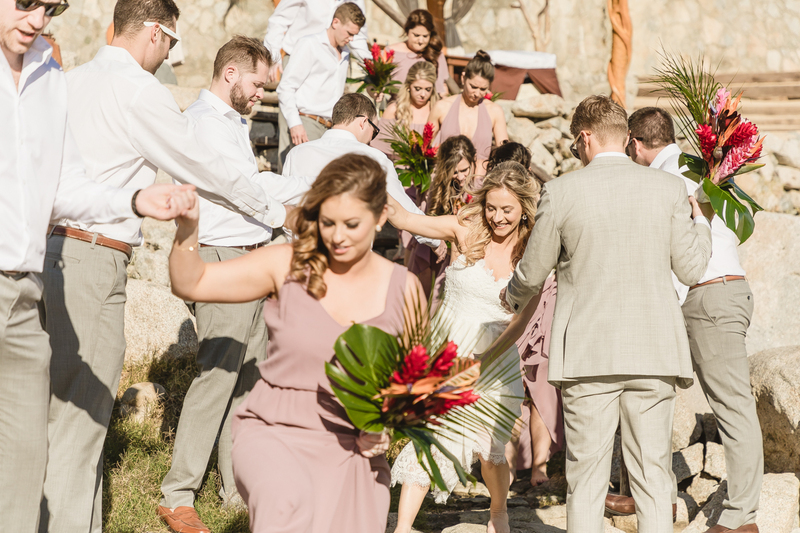 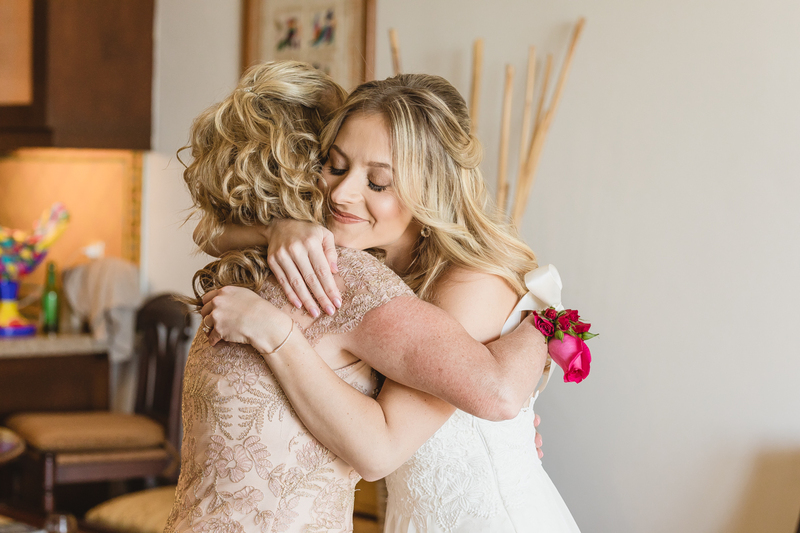 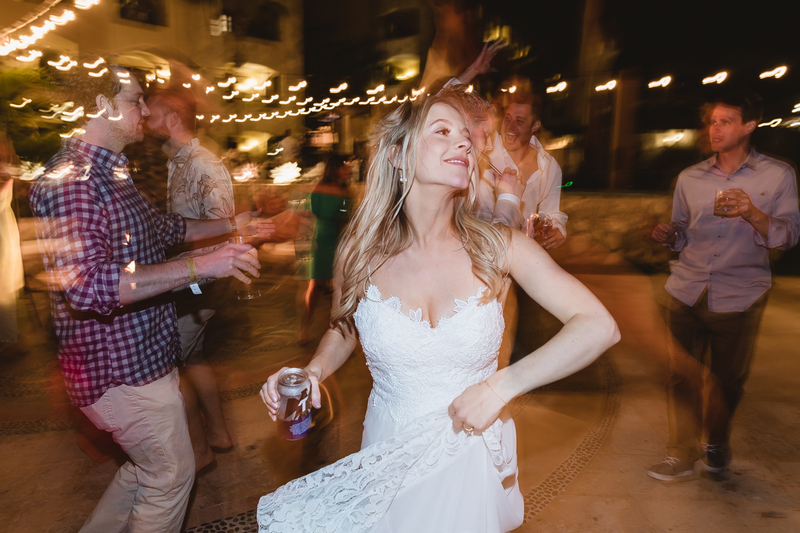 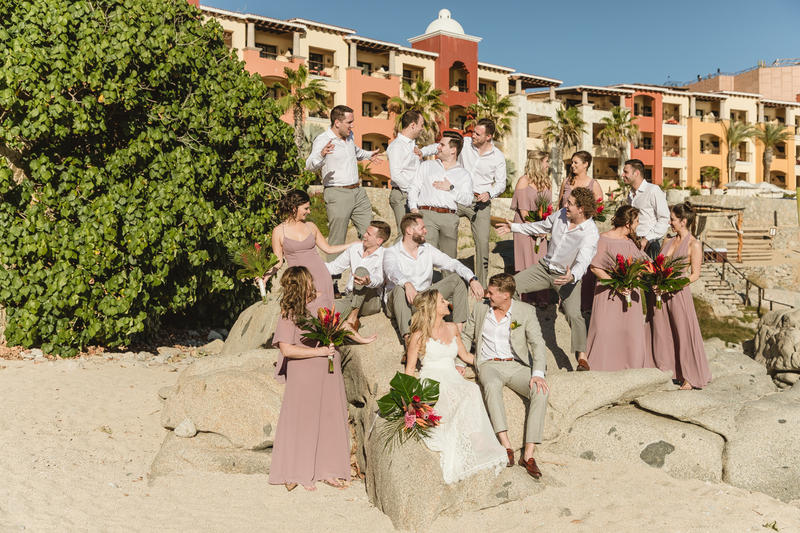 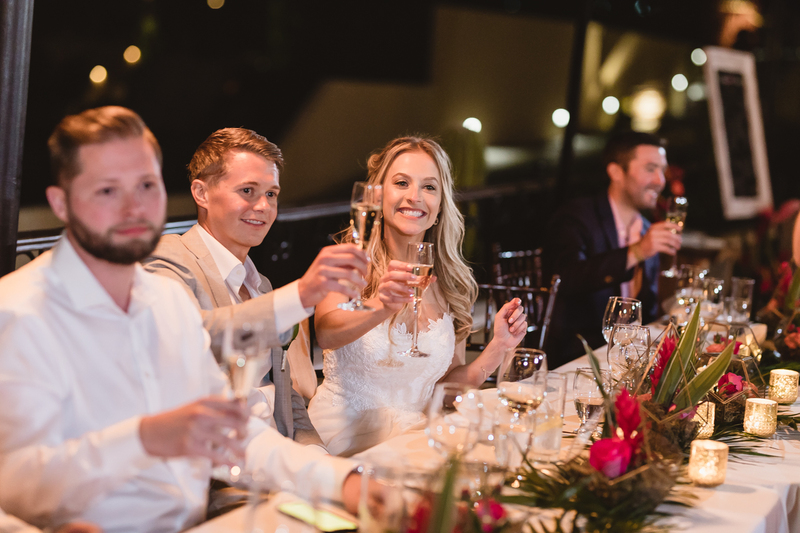 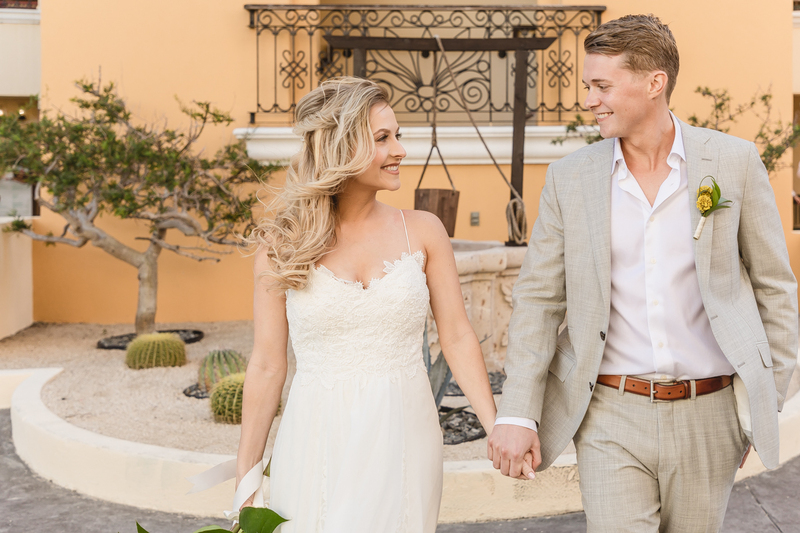 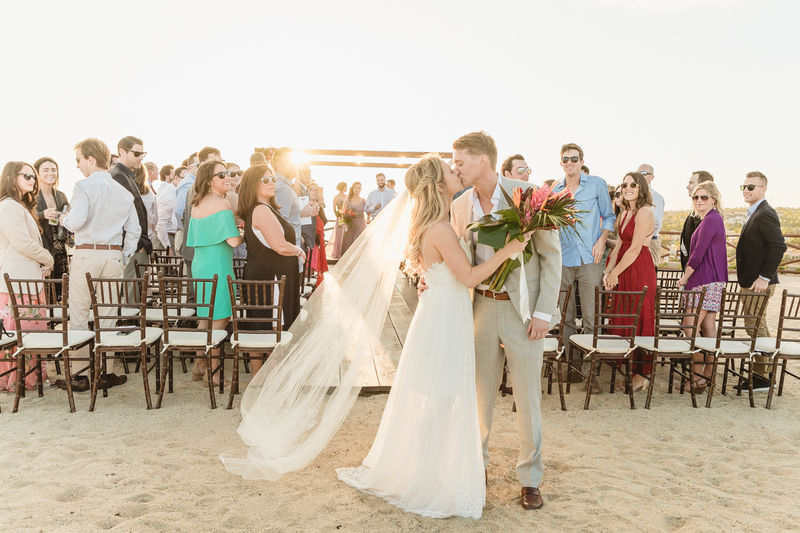 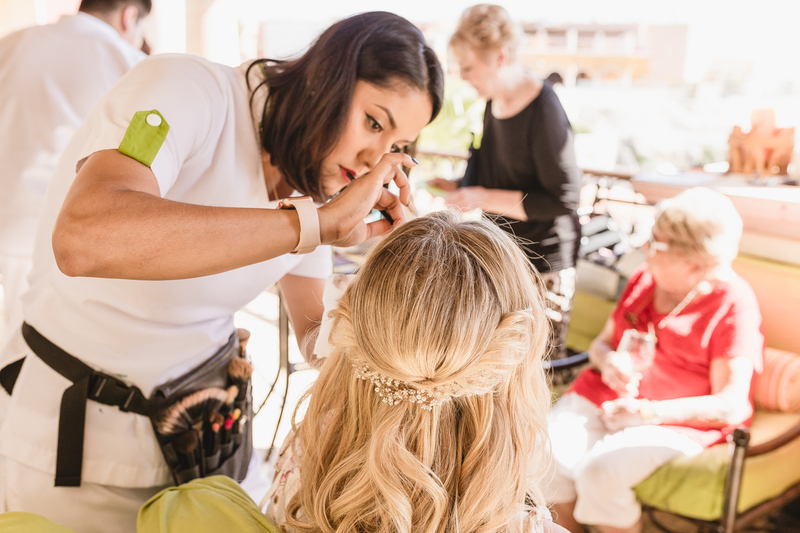 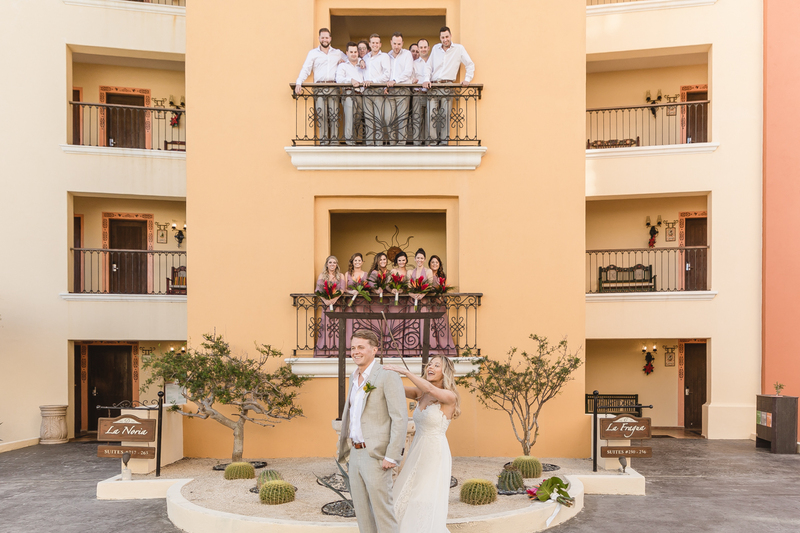 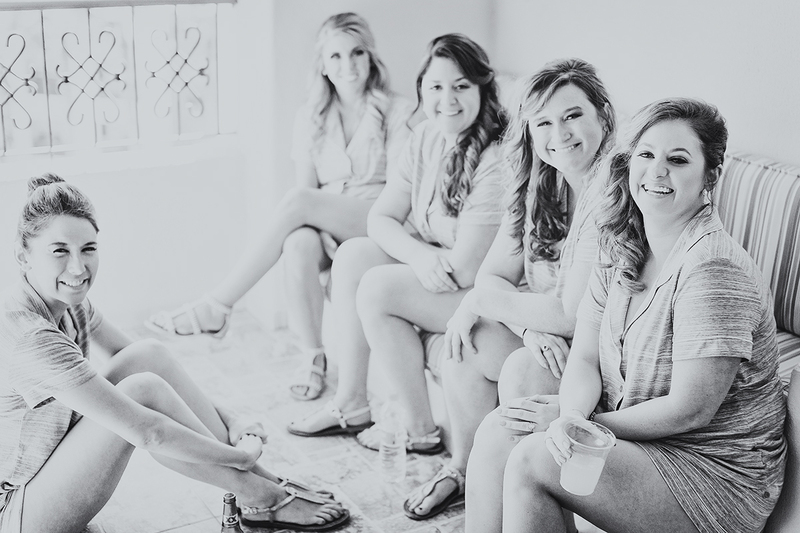 They knew from the get-go that they wanted an unforgettable wedding, and what better way to create magic than to invite your nearest and dearest to a New Year’s weekend getaway in sunny Cabo San Lucas. 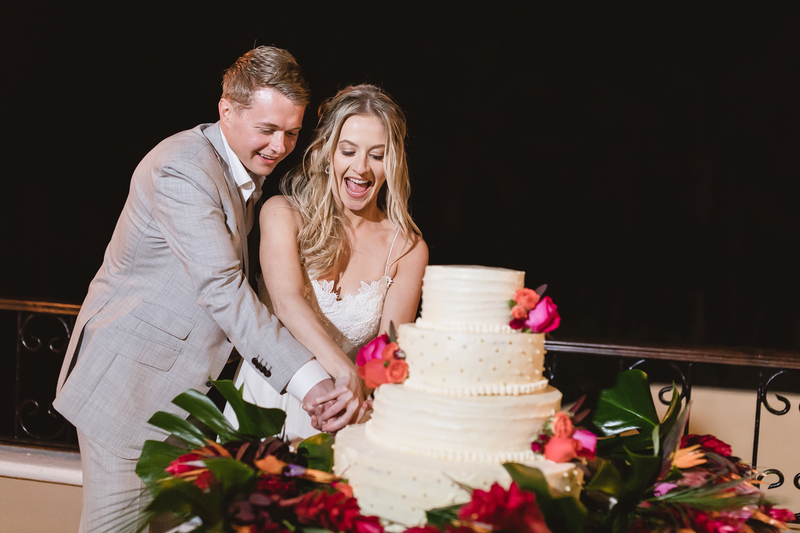 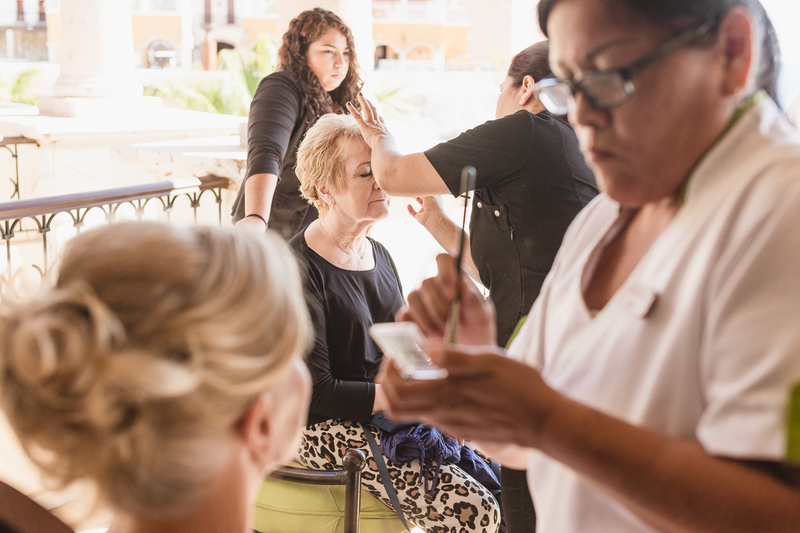 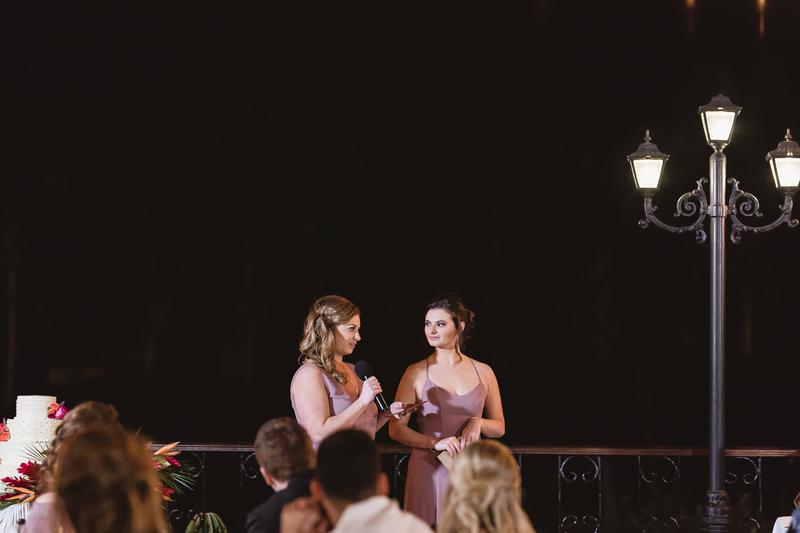 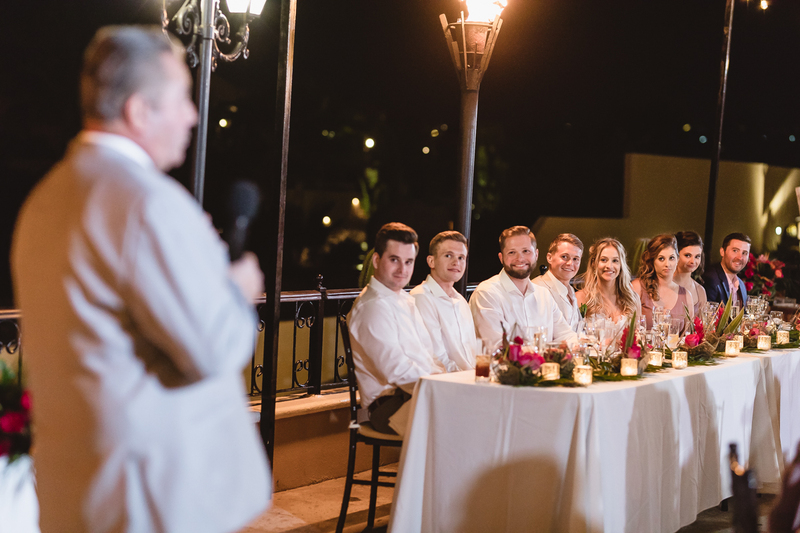 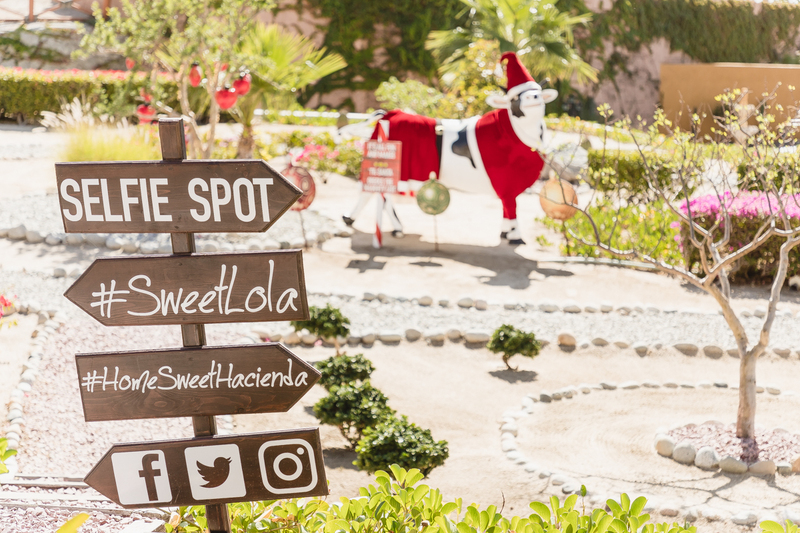 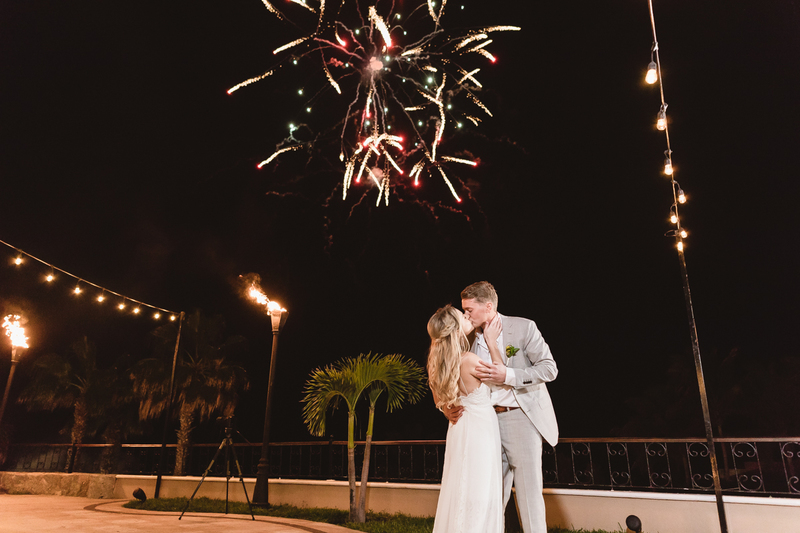 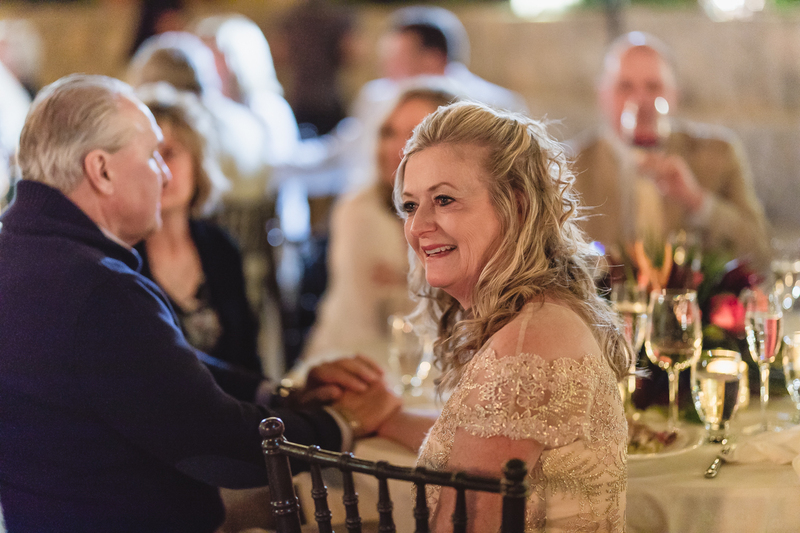 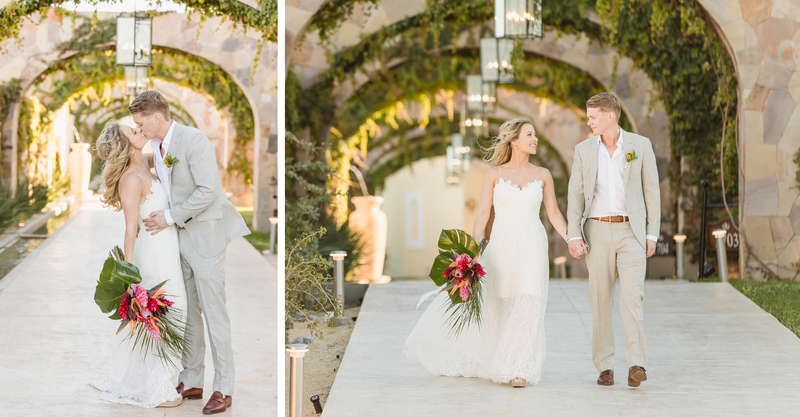 It didn’t take long for them to settle on the much loved Hacienda Encantada as the setting for their celebration. 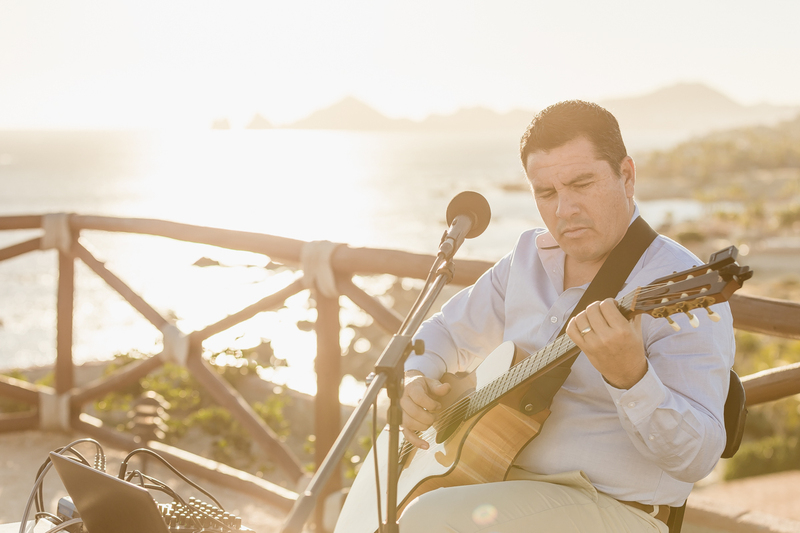 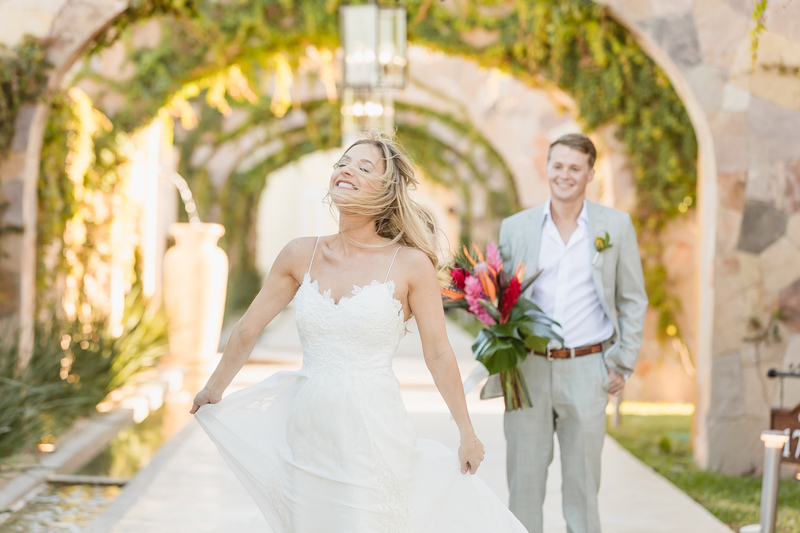 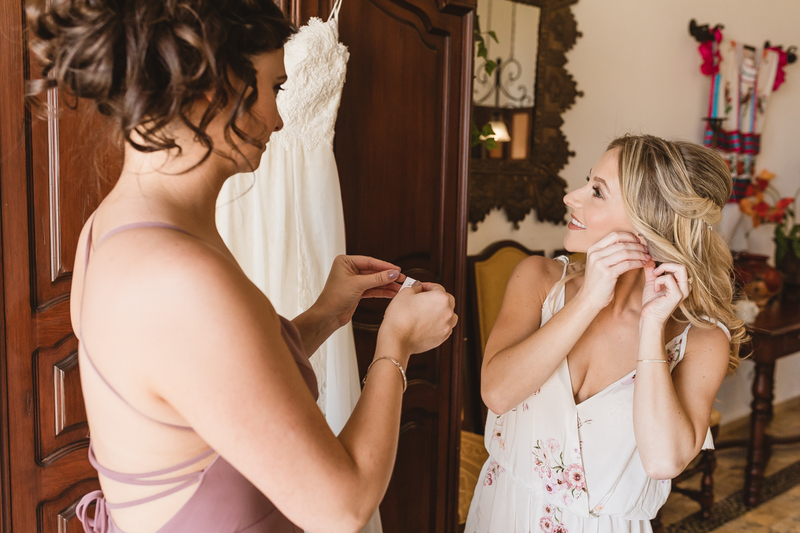 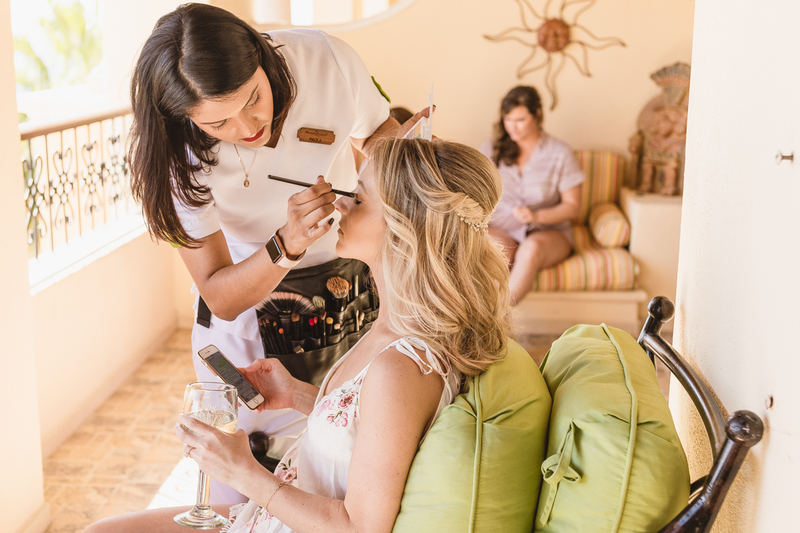 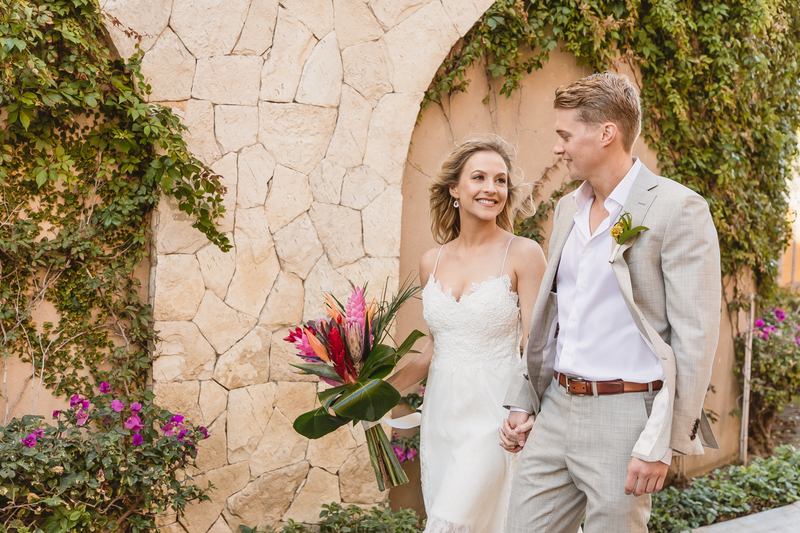 Located just 5 minutes from Cabo San Lucas’ bustling downtown, the hotel boasts stunning Hacienda style architecture, jaw-dropping views over the Sea of Cortez and one very attentive wedding planner in Ms. Luz Alvarez, who made sure Maggie’s vision played out to perfection. 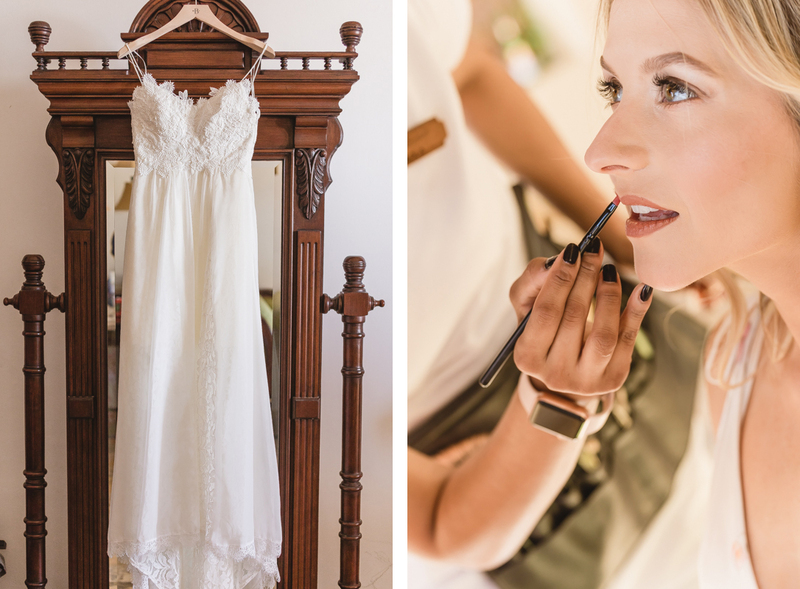 Maggie has a sharp eye for style, and her relaxed look was all things perfection. 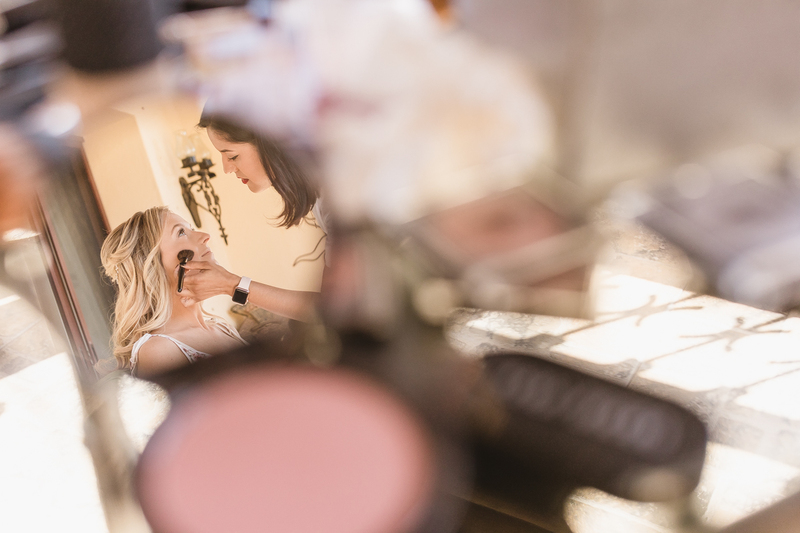 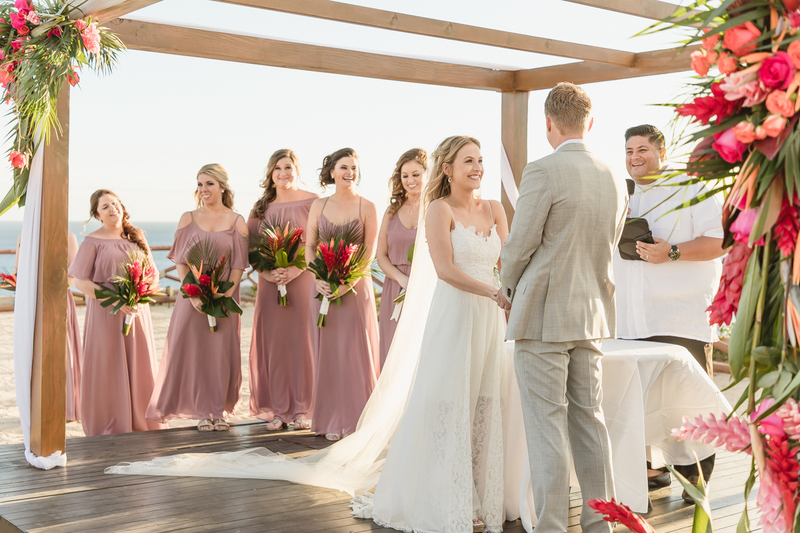 Relaxed beach waves and natural makeup perfectly complemented her flirty gown, stunning earrings, and headpiece by BHLDN and wedge-heeled shoes by Ugg, understated, expertly put together and just right for a toes-in-the-sand ceremony. 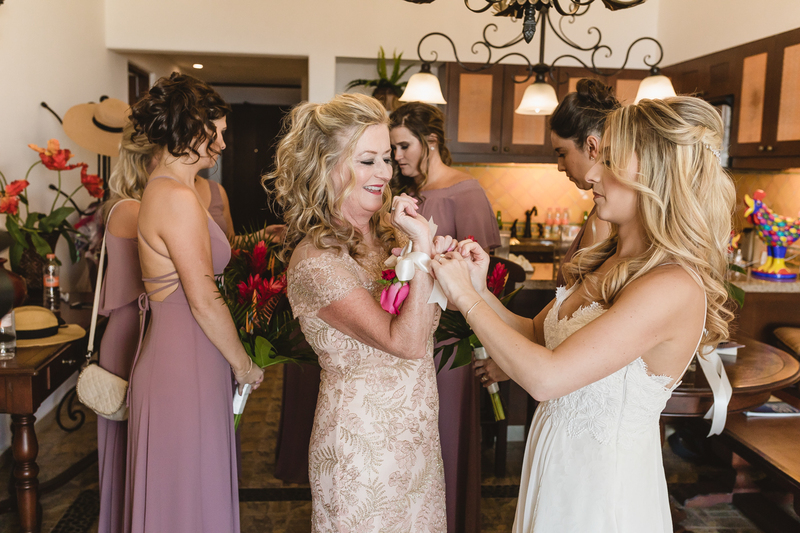 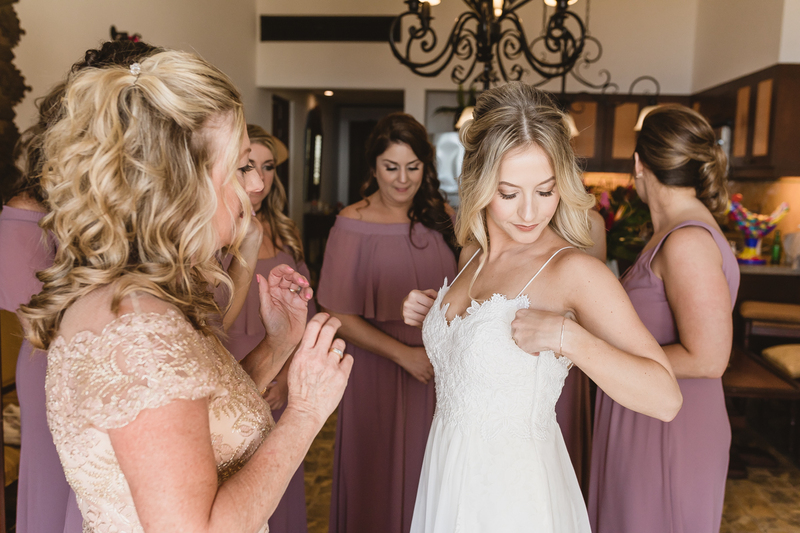 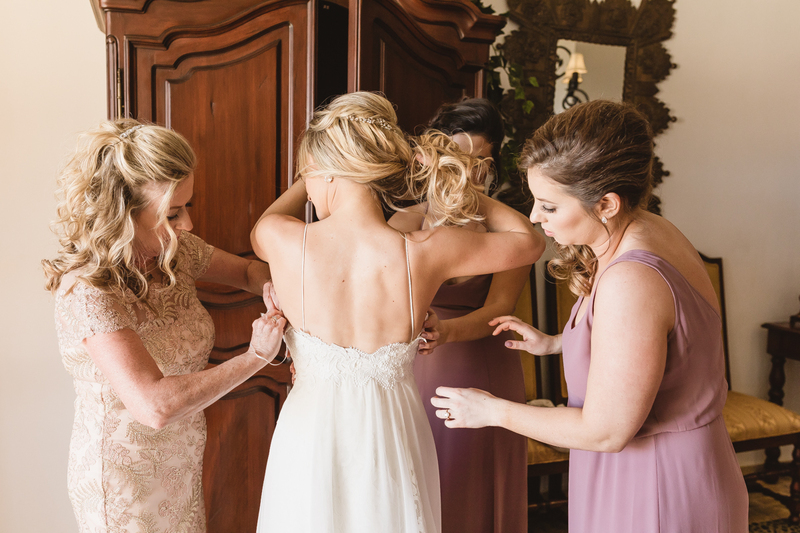 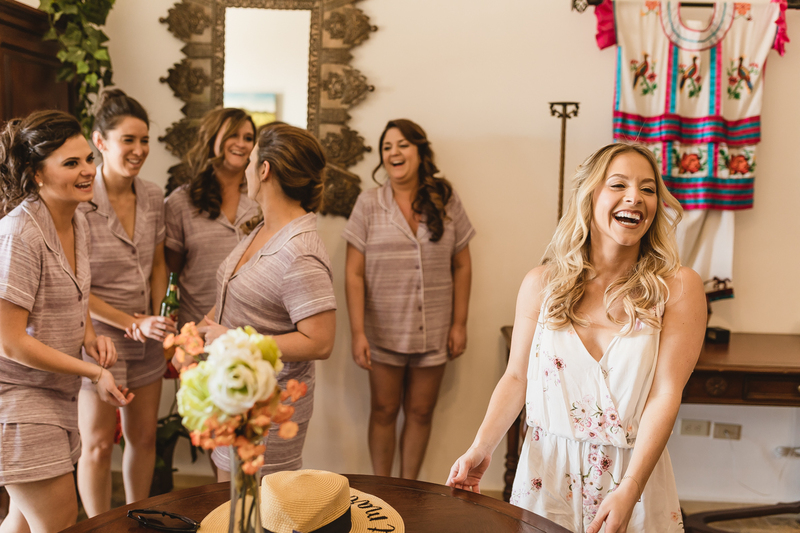 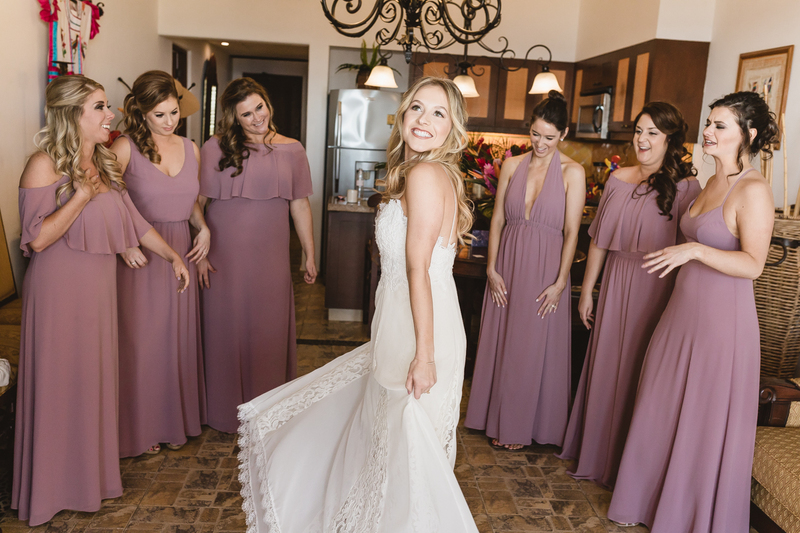 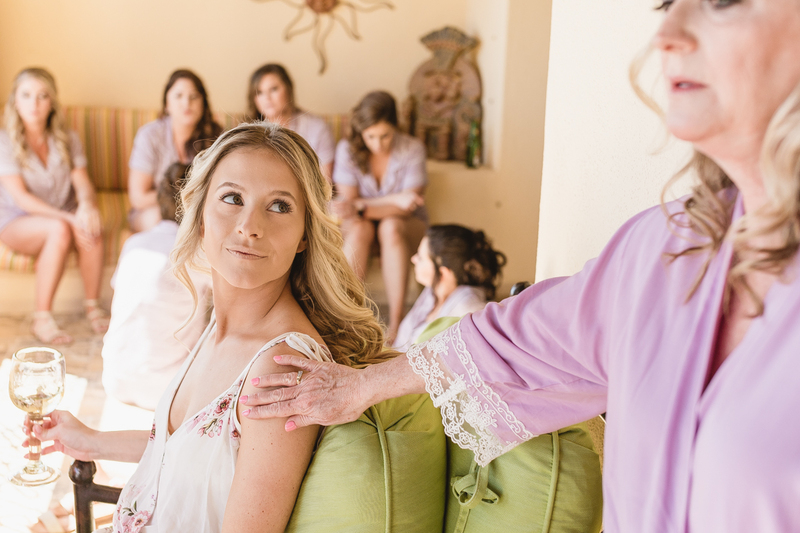 Her bevy of bridesmaids was on point, sporting Show Me Your Mumu Grecian inspired gowns in trending mauve, a shade perfect for winter or summer. 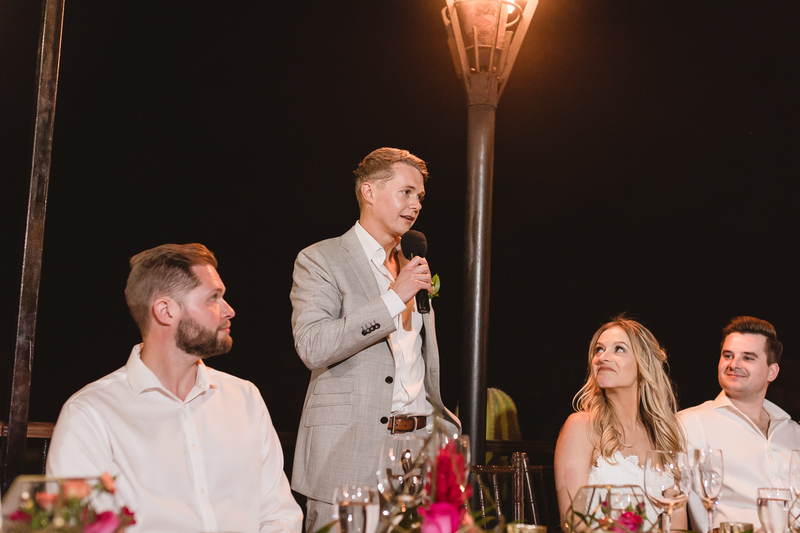 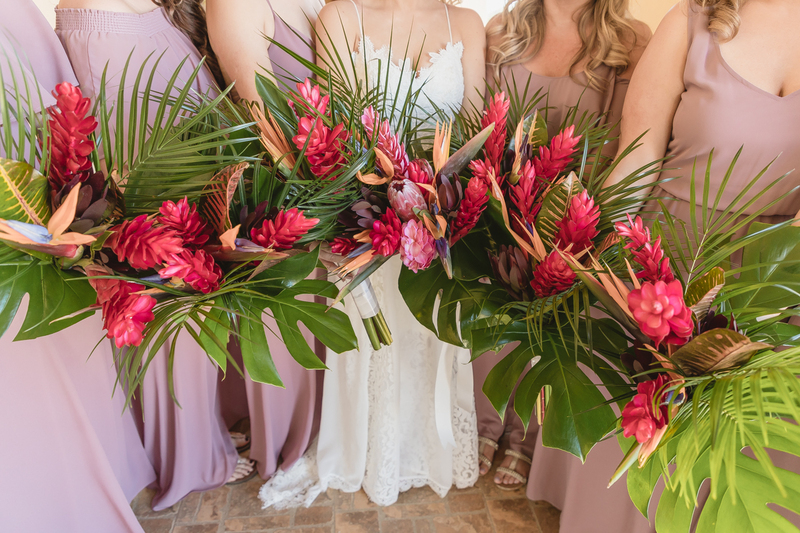 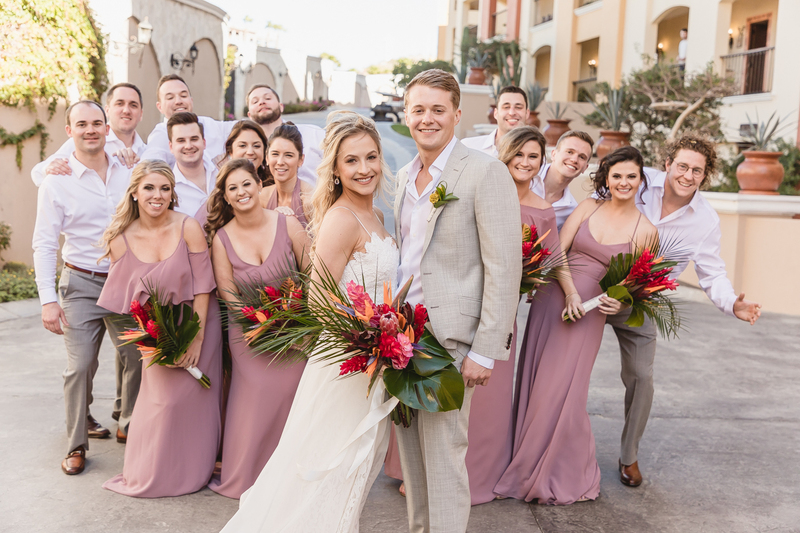 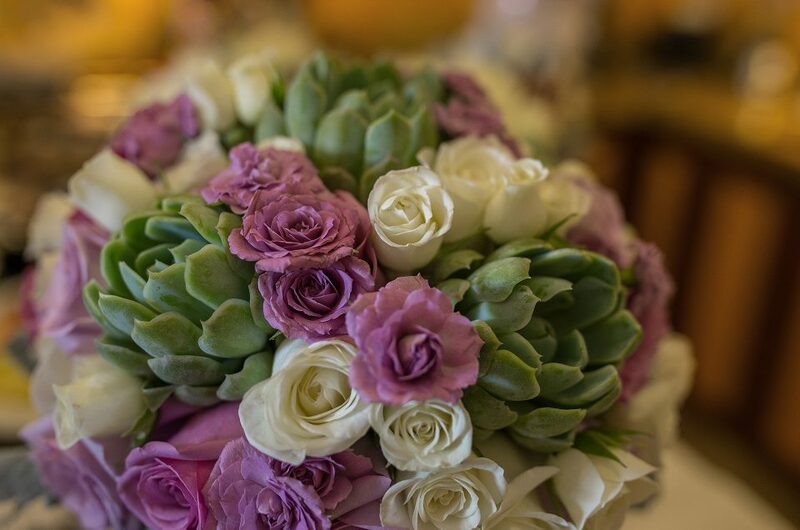 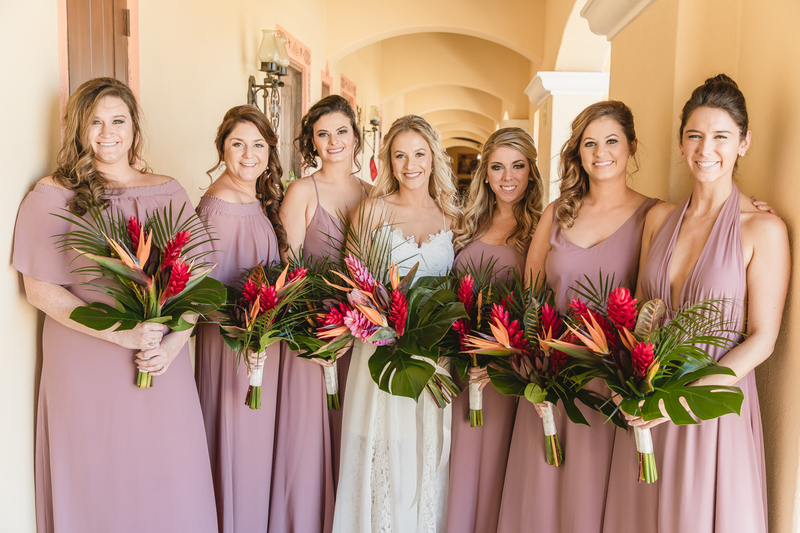 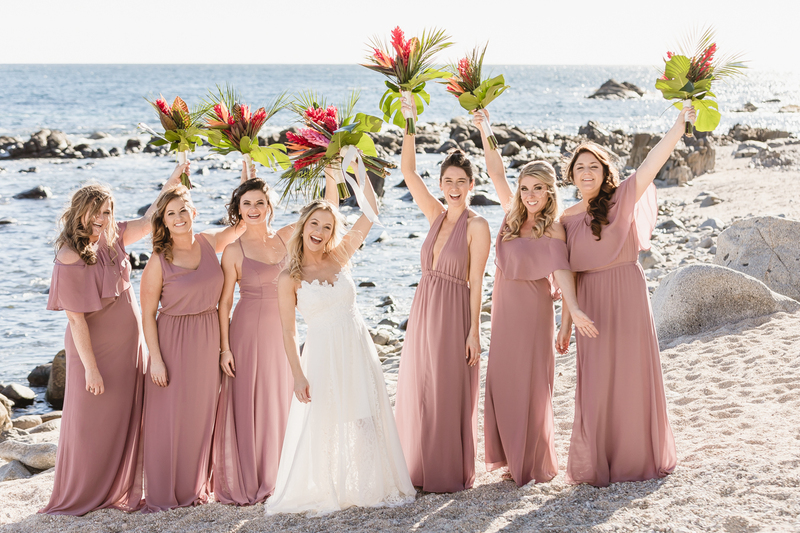 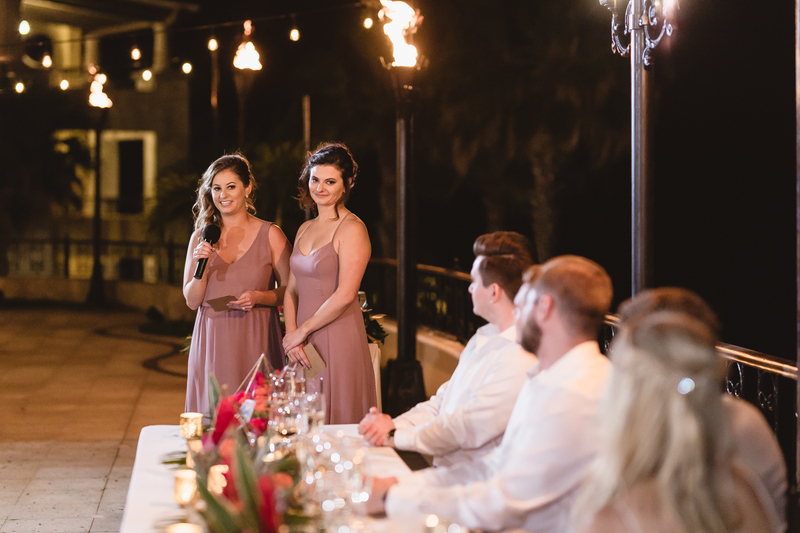 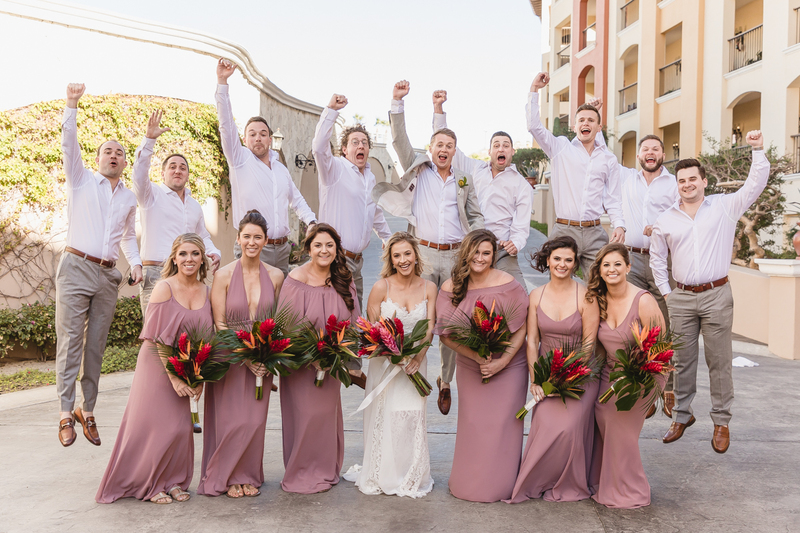 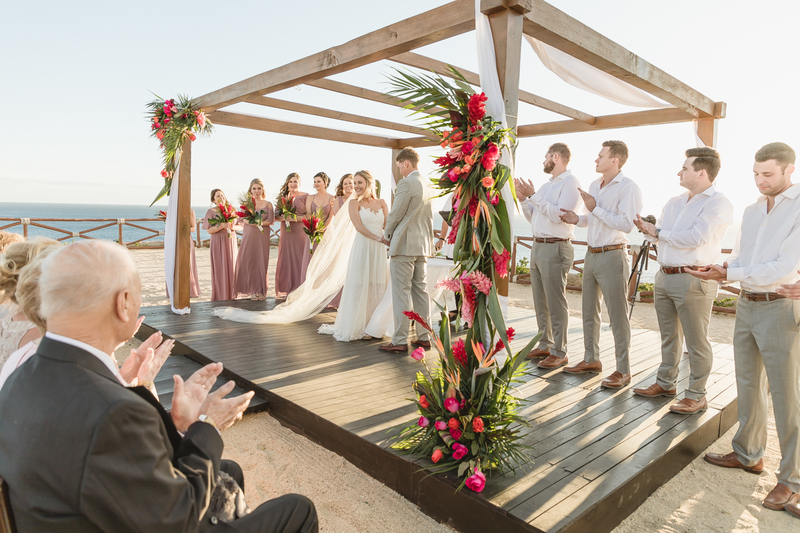 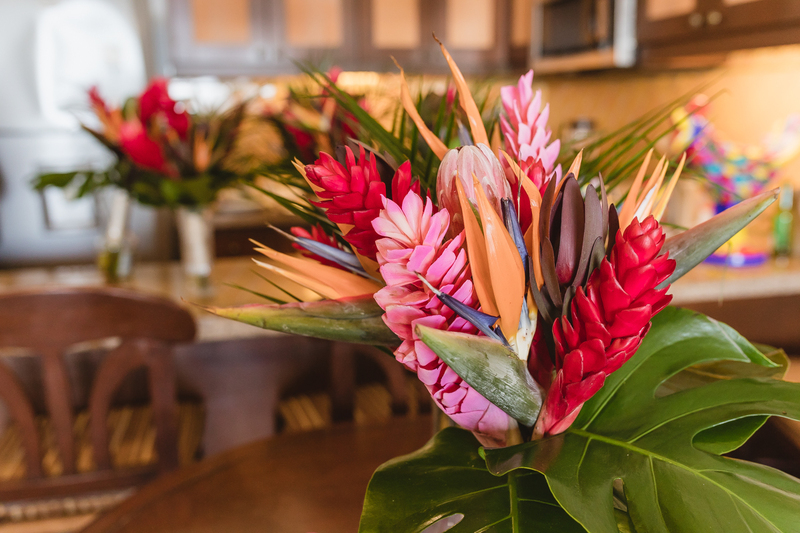 While Charles and his boys kept things cool in light beige and tan, the girls brightened things up with bouquets full of lush palm leaves and bright exotic flowers, designed by Flowers and Events. 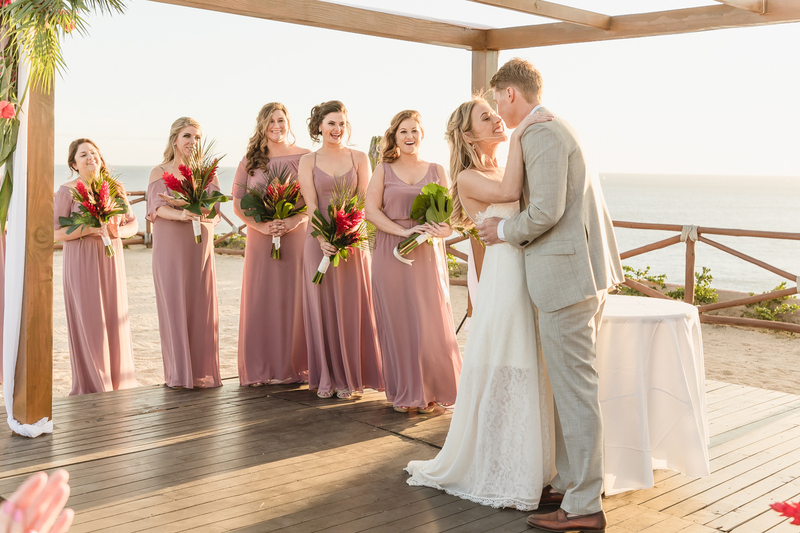 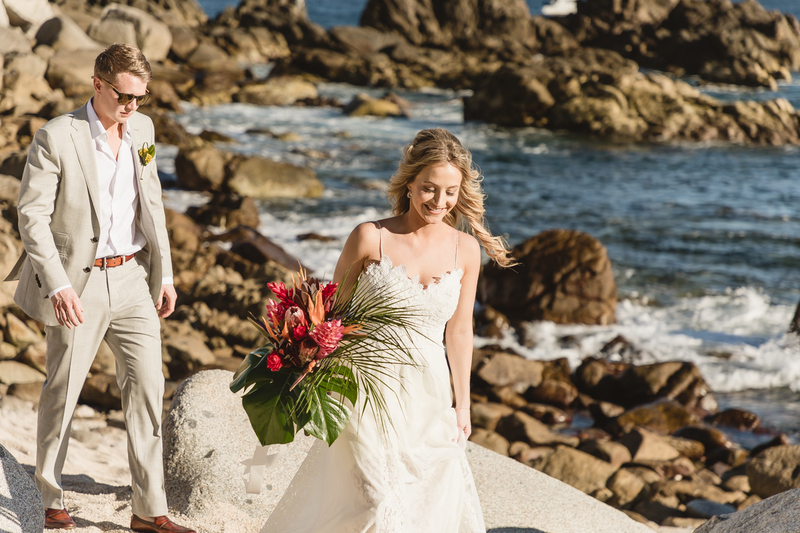 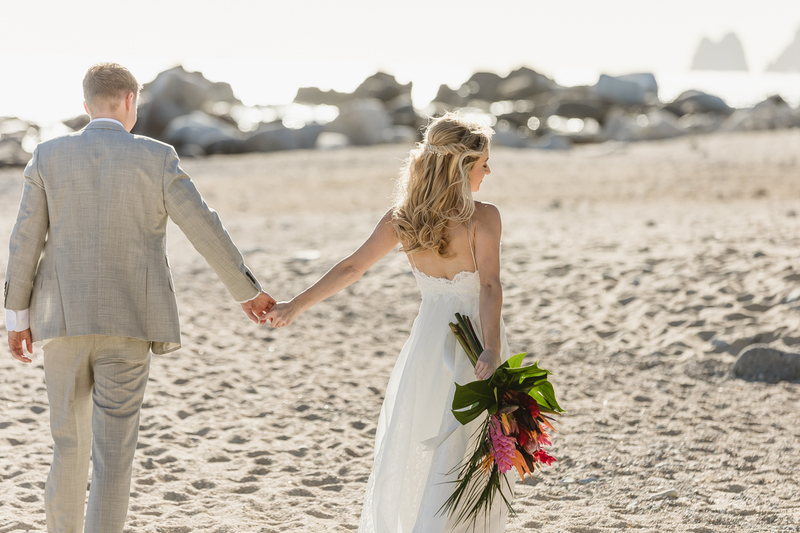 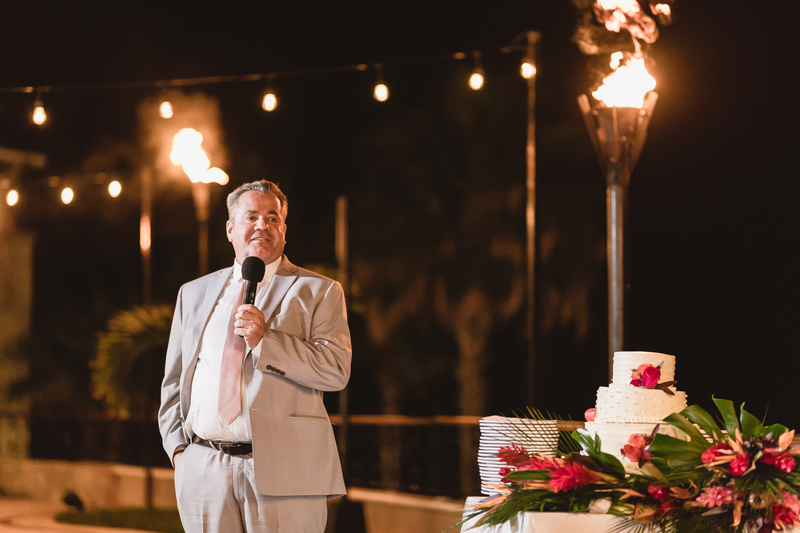 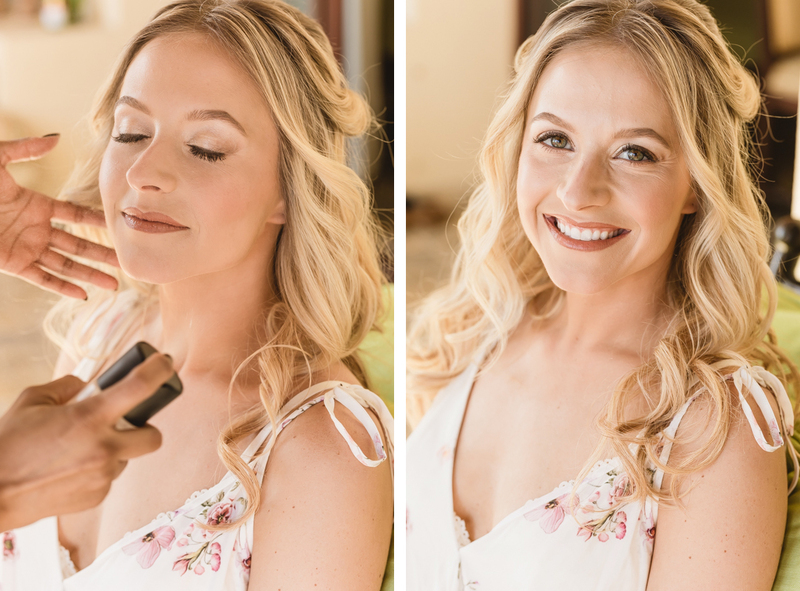 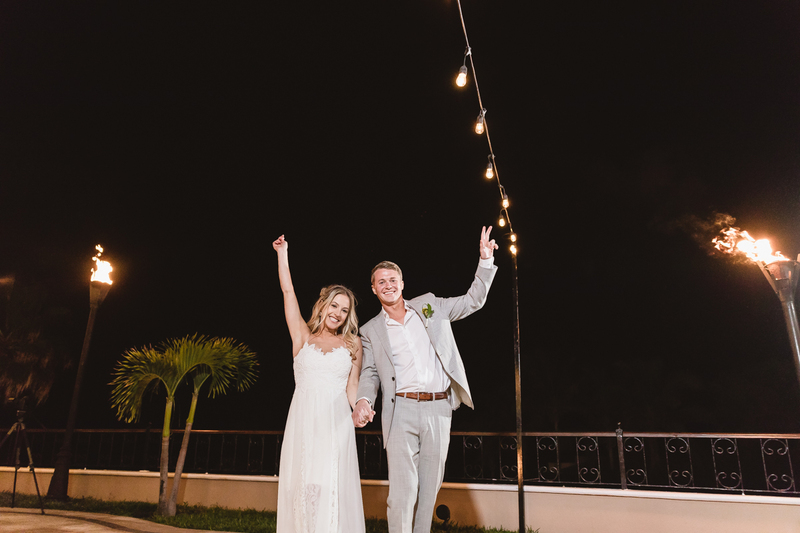 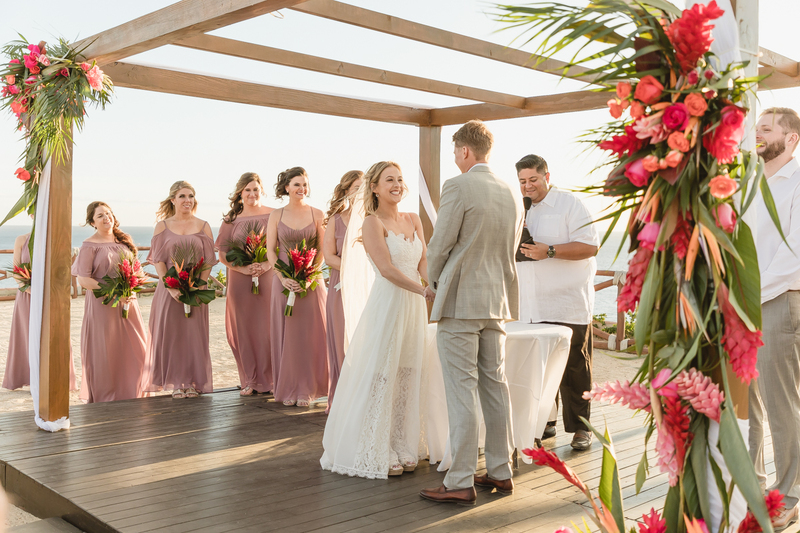 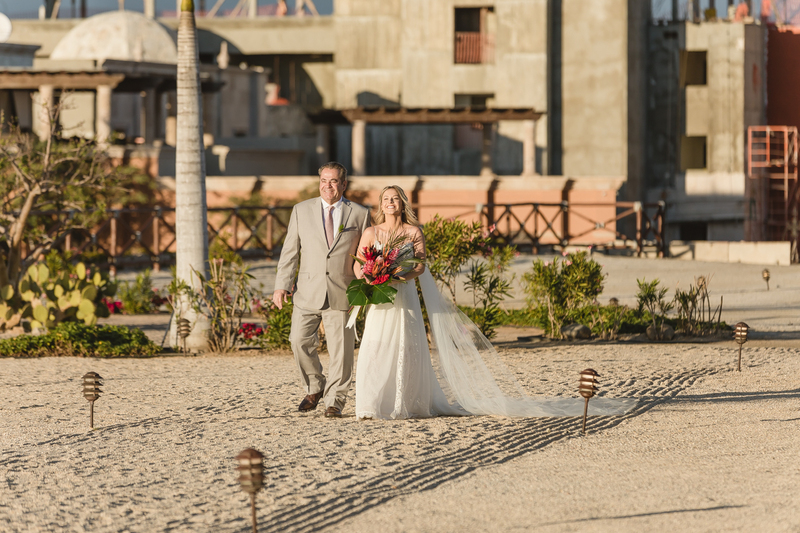 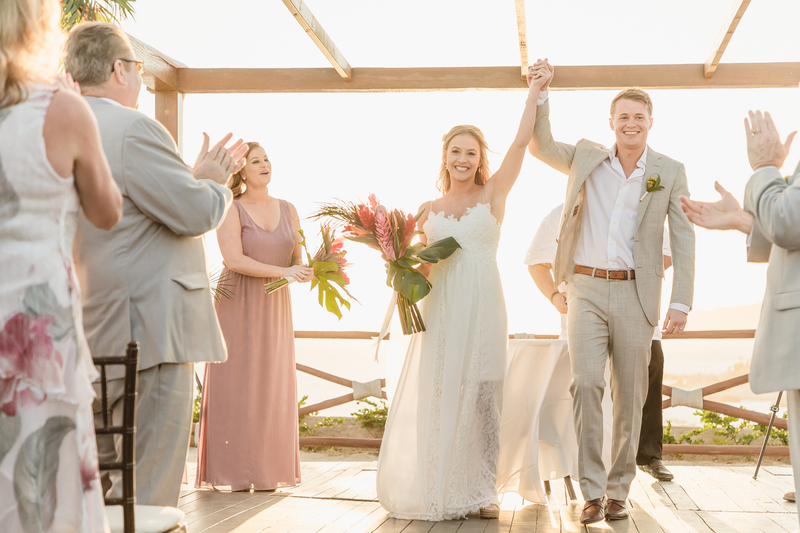 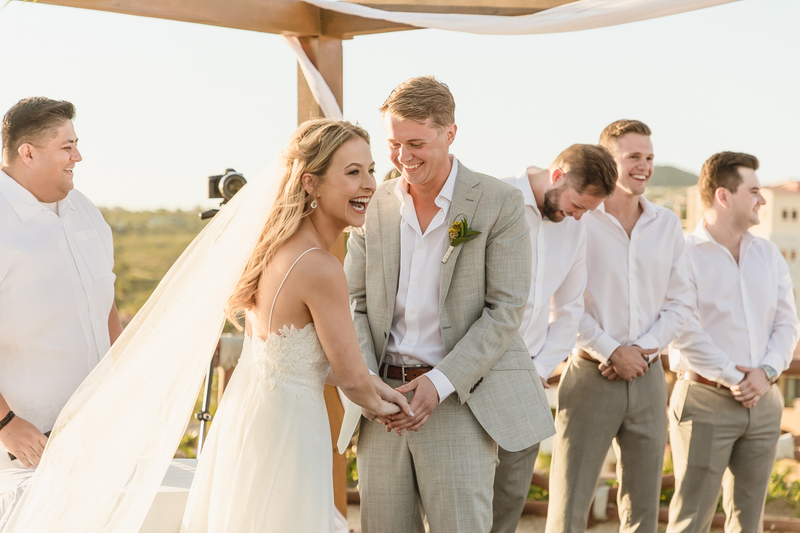 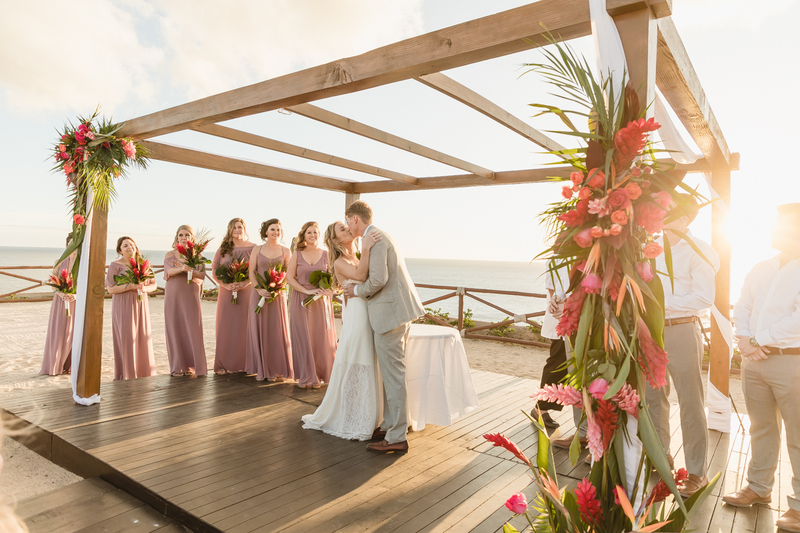 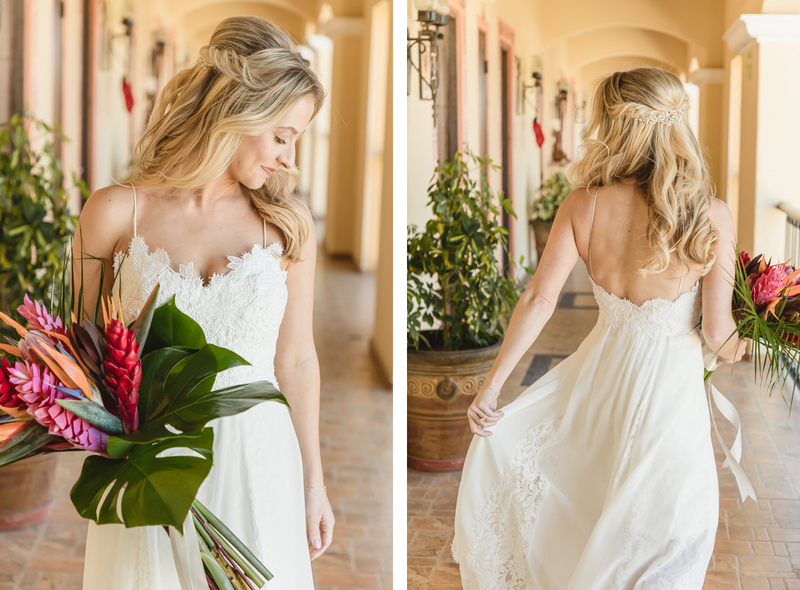 To take advantage of the near-perfect weather and the hotel’s ample grounds we had scheduled a quick, pre-ceremony first look, and both bride and groom shined before making the quick walk down to Hacienda’s beachside ceremony location. 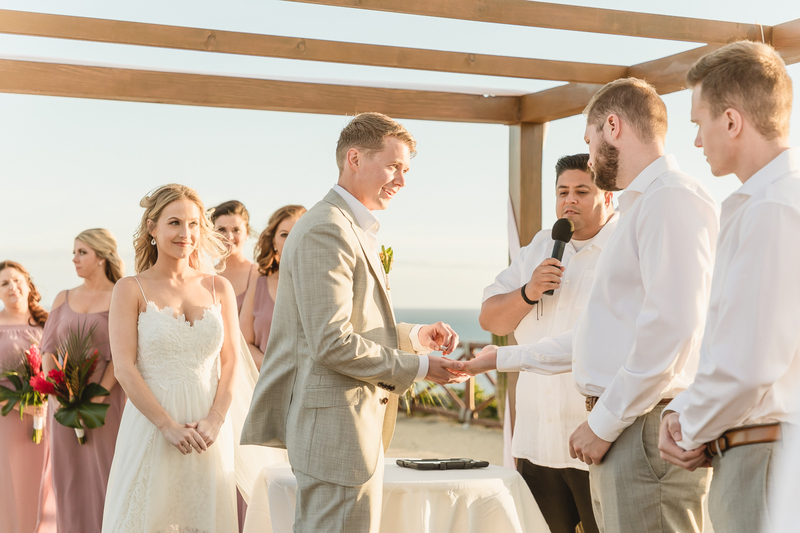 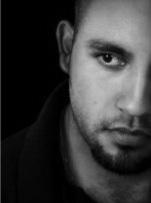 Reverand Marco Arechiga came threw once again, delivering a short and sweet ceremony that spoke of love, laughter and joy. 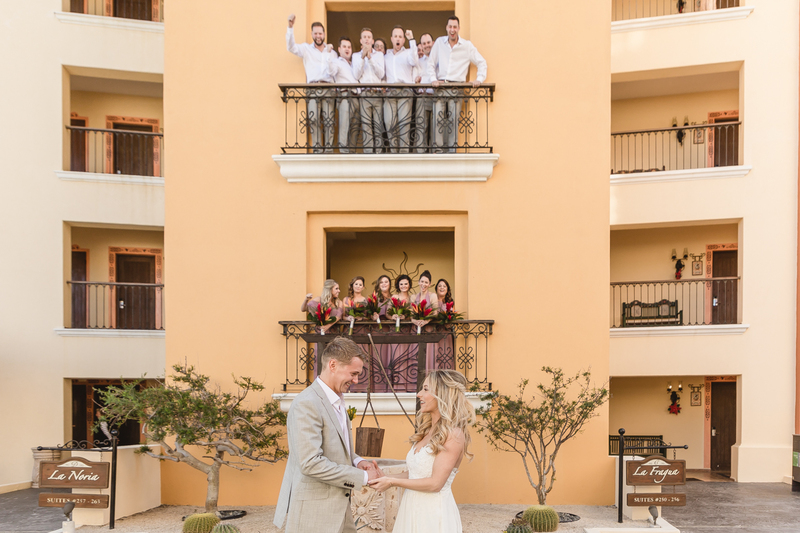 Completing the trifecta of Los Cabos’ best and brightest (including ourselves, of course!) 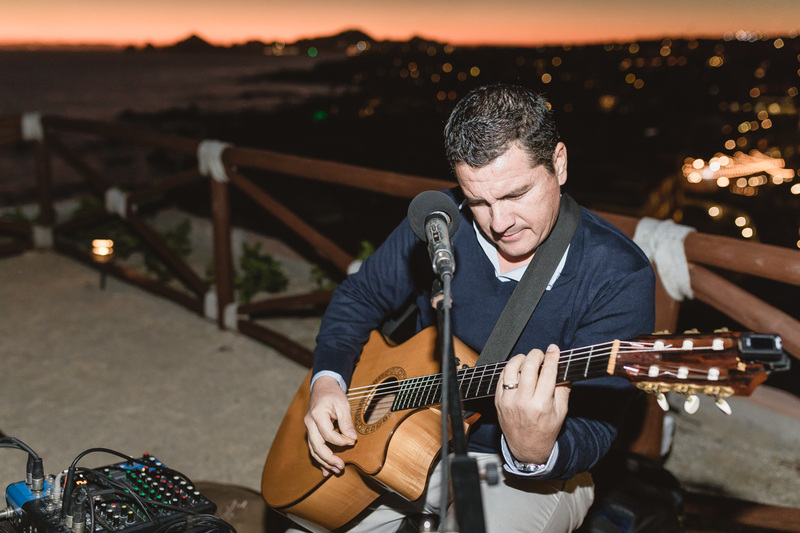 was the uber-talented Adan Mijares on guitar and decks, who provided the tunes that kept this group jiving well into the evening. 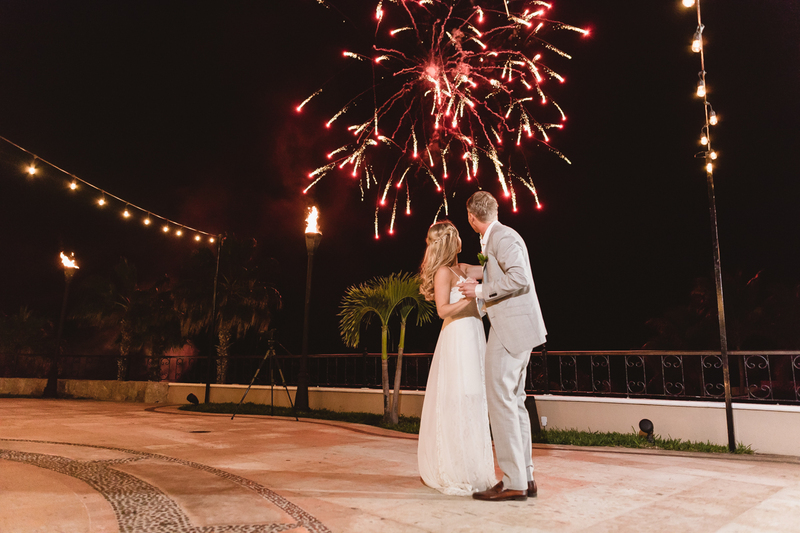 When guests were left thinking they had seen it all, Cabo Fireworks lit up the night sky, the perfect send off to a very special celebration. 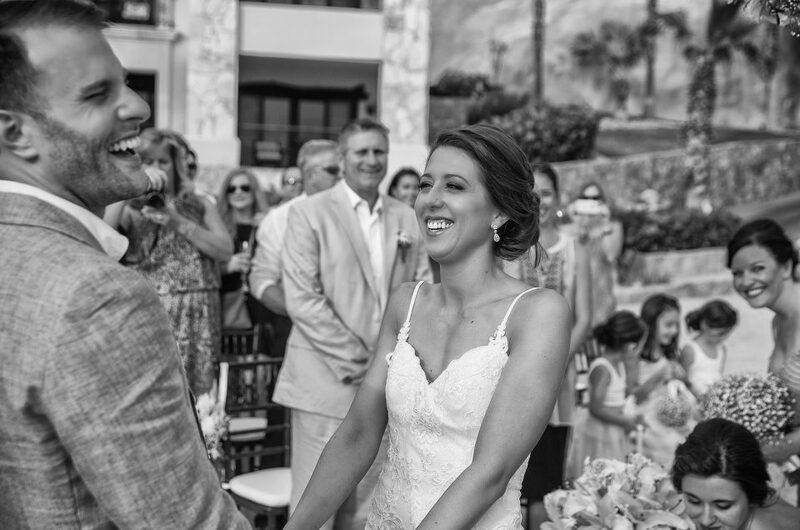 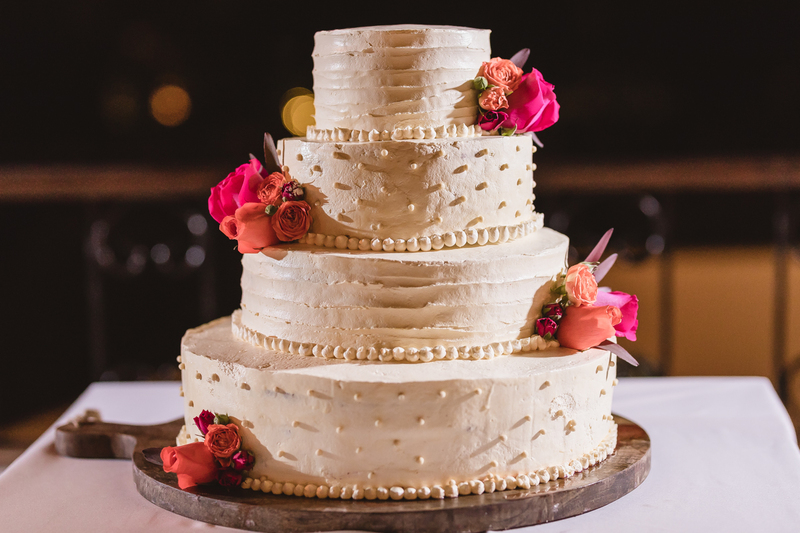 Maggie likes to pay it forward, and was kind enough to give us the scoop on her special day. 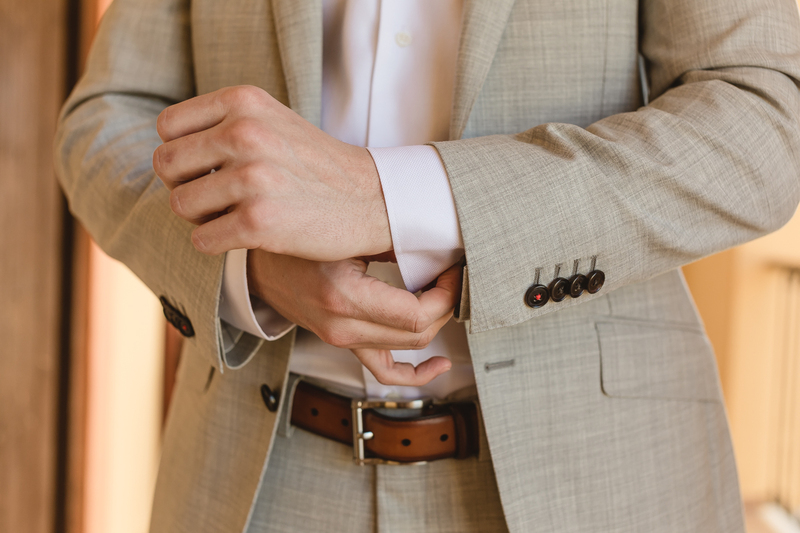 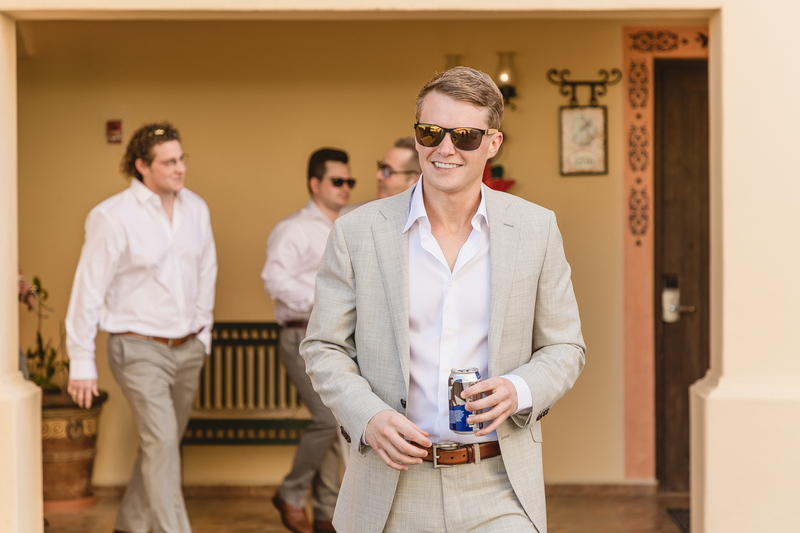 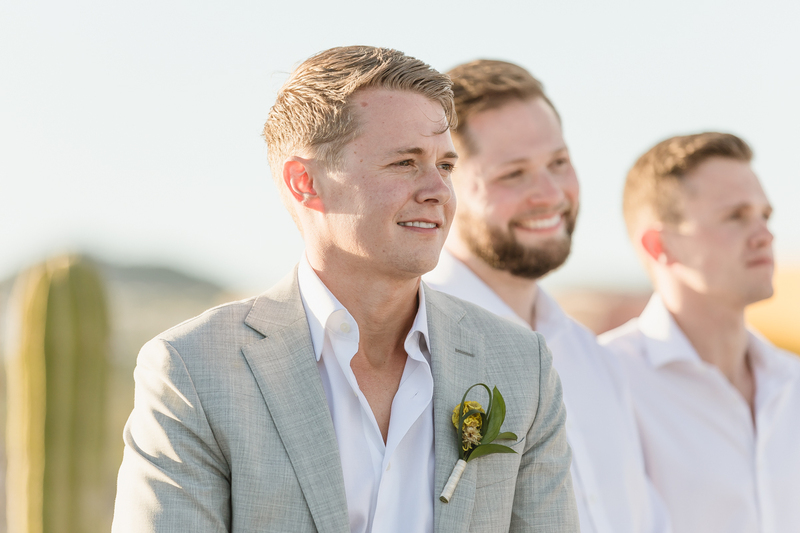 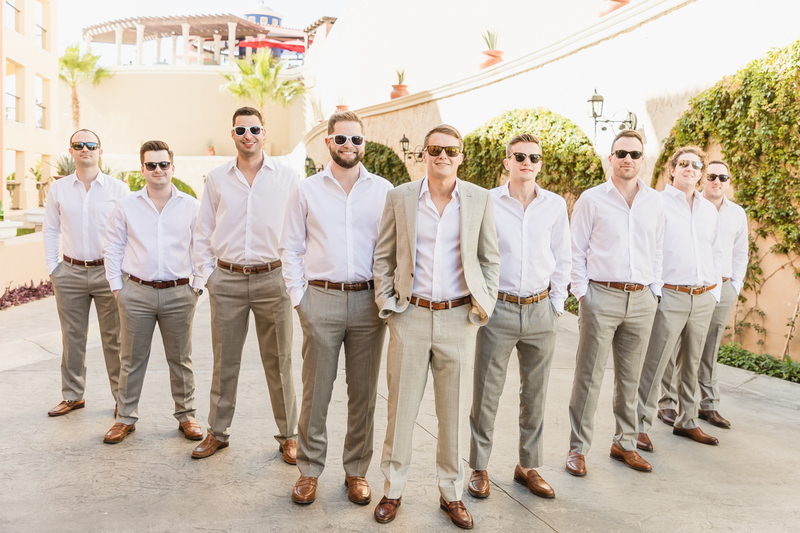 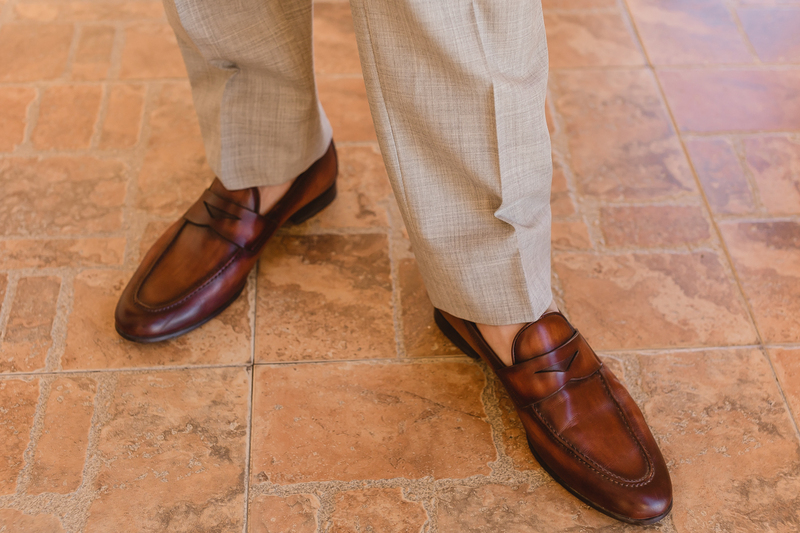 If you are newly engaged in the Illinois area, try Suit Supply in Chicago for your groom’s attire and Volles Bridal Boutique in Wauconda for, well, pretty much anything! 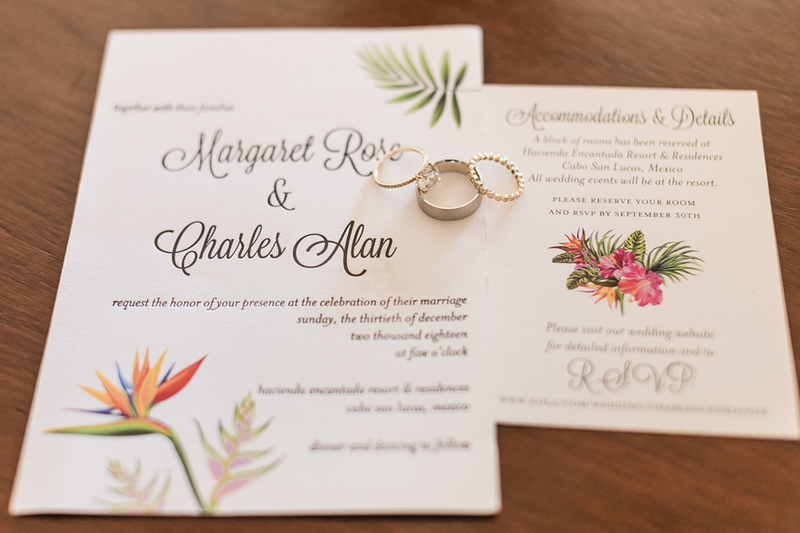 Looking for personalized stationery with that wow factor? 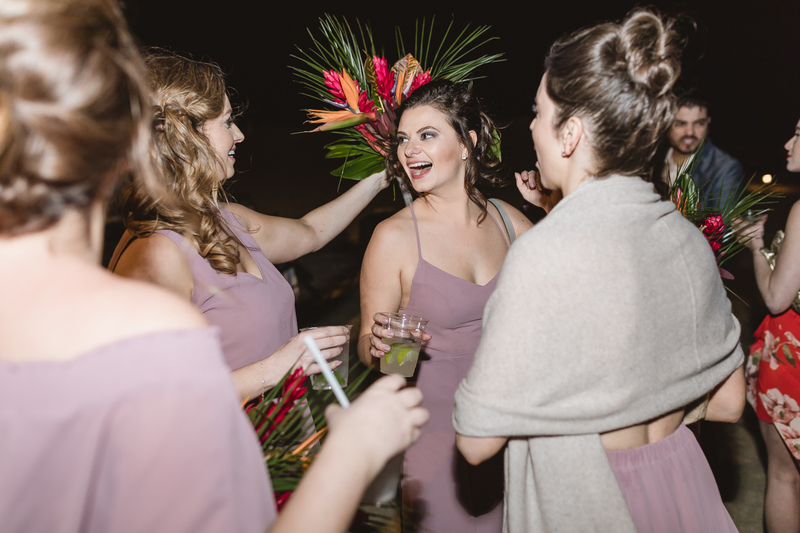 Maggie’s dreamy invitations and wedding day programs were designed and created by Letterpress by Lydia in Libertyville, another must visit for the Chicago bride. 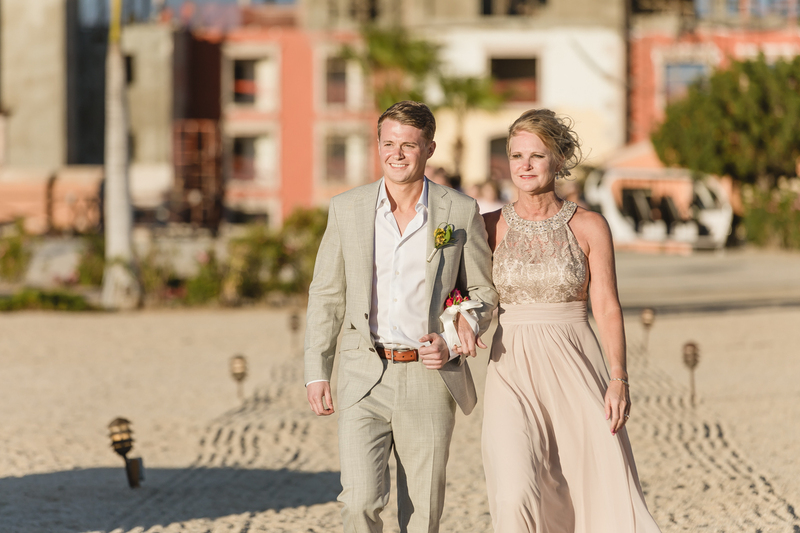 Congratulations on a very special milestone Maggie and Charles. 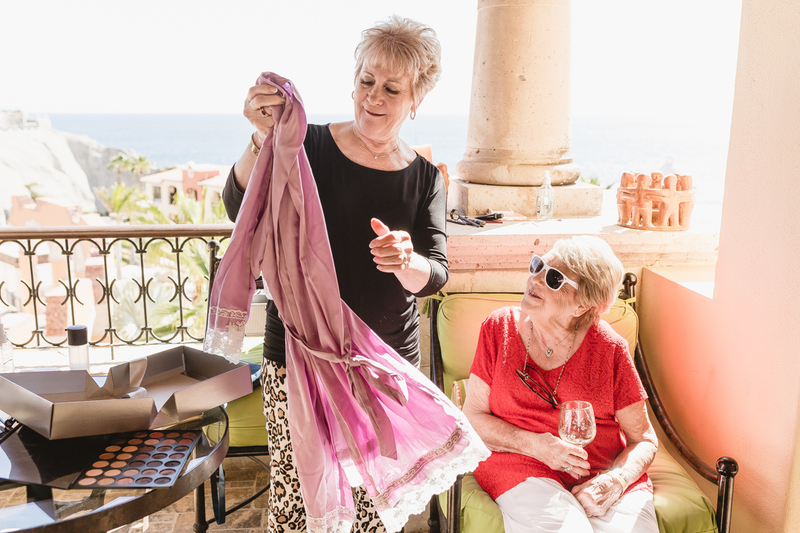 We in Cabo wish you love and laughter for many long years to come.